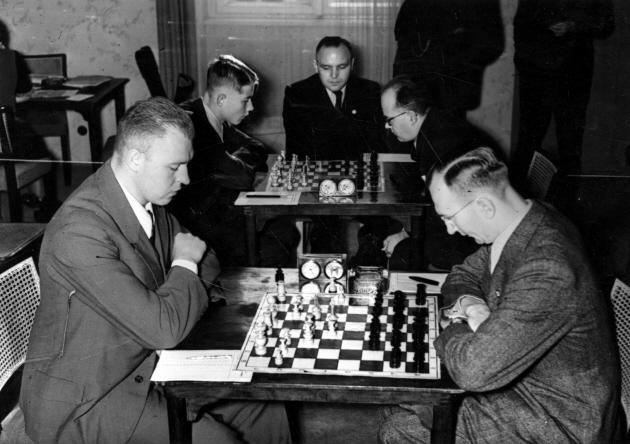 The Marshall Chess Club is currently cataloguing its photographic archives, and Alexander George (Amherst, MA, USA), who is on the club’s Board, submits the above photograph. Is it definitely, as believed, Lina/Lena Grumette, and can the picture be dated? 35...e3 36 Bxe3 Qe8+ 37 Kxa7 Qa4+ 38 Kb8 Qe8+ 39 Ka7 Qa4+ 40 Kxb6 Qxa8 41 a3 Qa4 42 Qb4 Qe8 43 Qb5 Qb8+ 44 Ka5 Qd8+ 45 Kb4 Qe7+ 46 Kb3 Be6+ 47 Kb2 Qd8 48 Kc1 Qa8 49 Qb4 Qh1+ 50 Kd2 Qd5+ 51 Ke2 Bg4+ 52 f3 Qxf3+ 53 Kd3 Qd5+ 54 Bd4 Bf5+ 55 Ke2 Qe4+ 56 Be3 Qc2+ 57 Kf3 Qd1+ 58 Kf4 Qg4 mate. 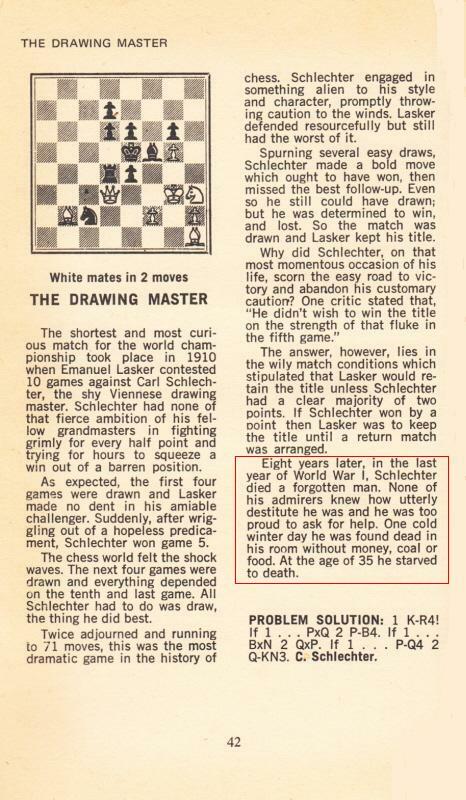 Source: Washington Chess Letter, August 1950, page 12. 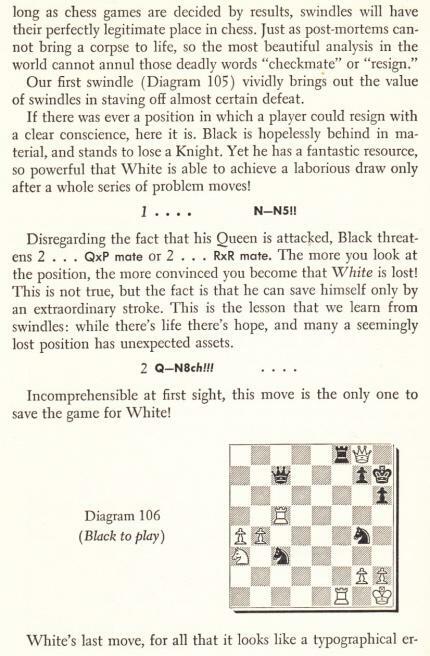 Mr Scoones draws attention to the passage below from page 116 of Chess the Hard Way! by D.A. Yanofsky (London, 1953). 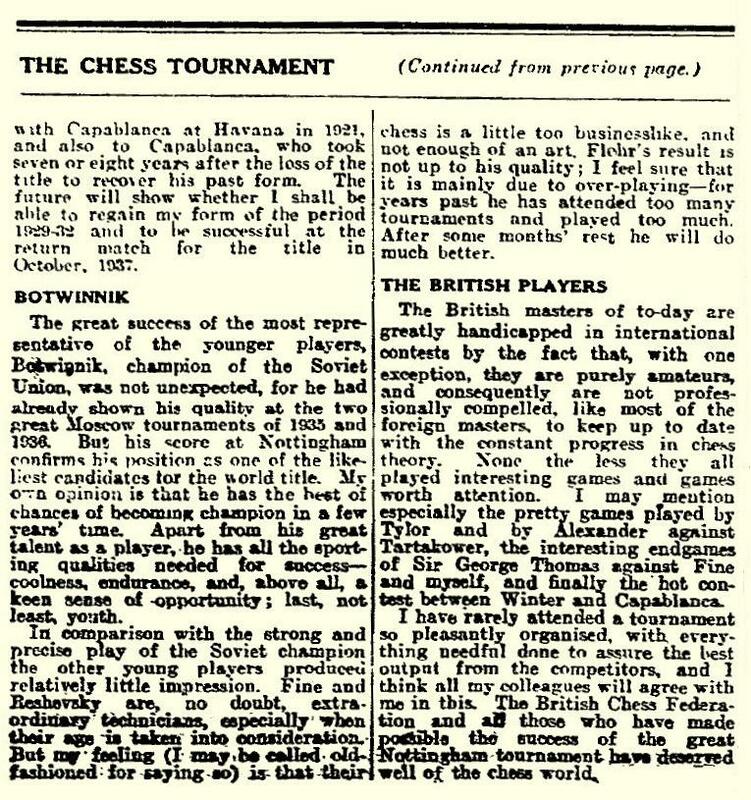 ‘Hastings’ refers to the 1946-47 tournament, in which he came fourth. 1 e4 e5 2 Nf3 Nc6 3 Bb5 a6 4 Ba4 Nf6 5 O-O Be7 6 Re1 b5 7 Bb3 O-O 8 c3 d5 9 exd5 e4 10 Ng5 Bd6 11 Nxe4 Nxe4 12 Rxe4 Bf5 13 Re3 Ne5 14 h3 Qh4 15 Bc2 Ng4 16 Re2 Bxc2 17 Qxc2 Rae8 18 d4 Qxf2+ 19 White resigns. 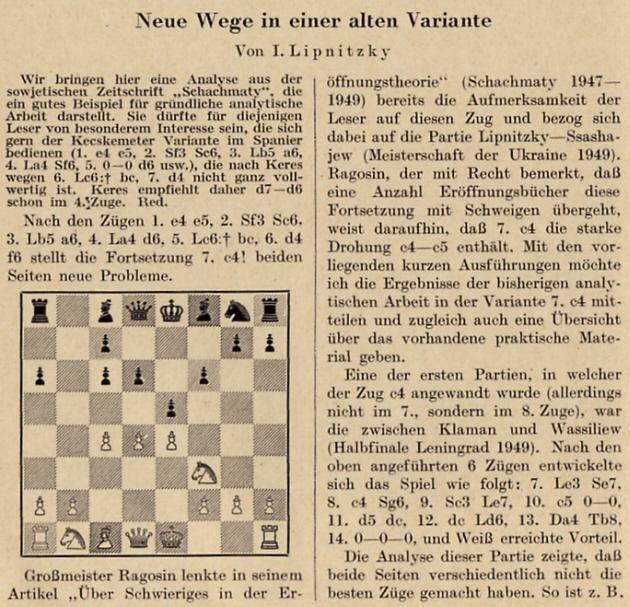 Alan McGowan (Waterloo, Canada) notes that Lipnitsky’s analysis was republished on pages 250-252 of the August 1952 Deutsche Schachzeitung. 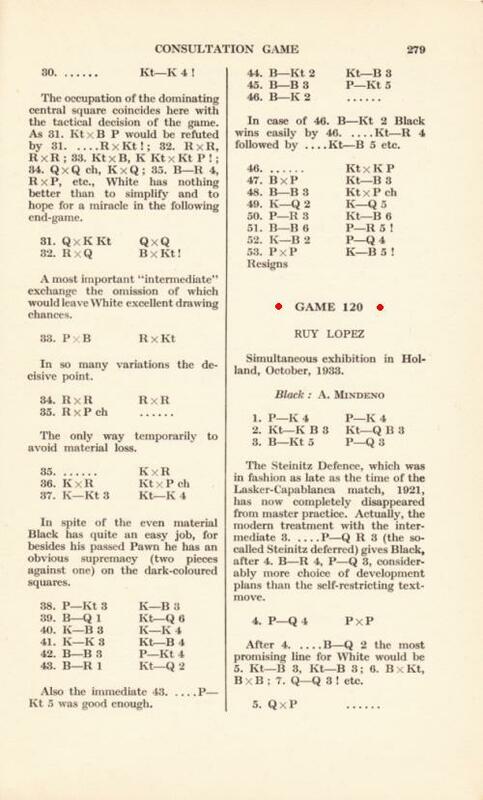 The 1949 Lipnitsky v Smirnov game was mentioned on page 251, the venue being specified as Kiev, 1949. Olimpiu G. Urcan (Singapore) draws attention to an impressive series of articles by Lim Kok Ann on the 1978 world championship match. 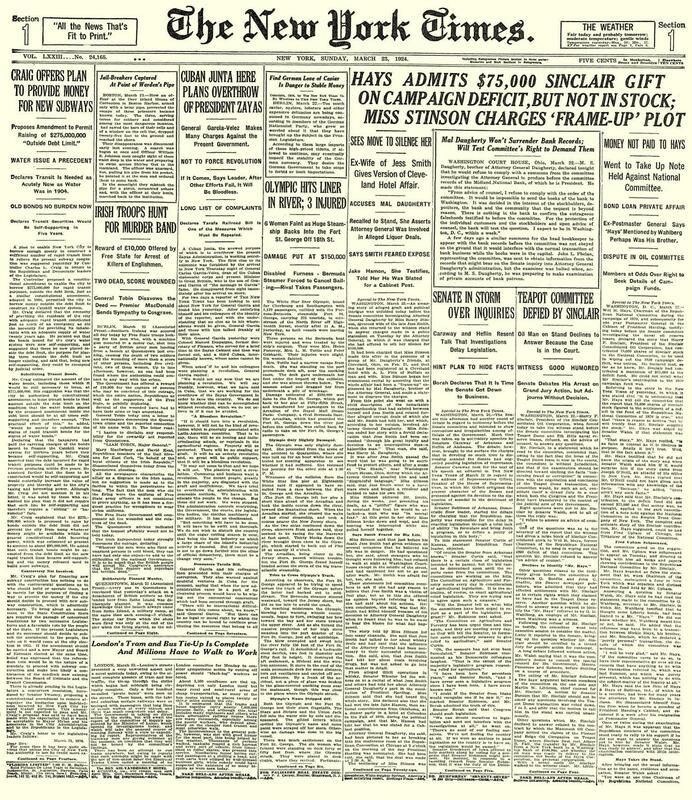 The Times, 12 April 1929, page 18. As ever in such cases, information about copies of better quality will be appreciated. 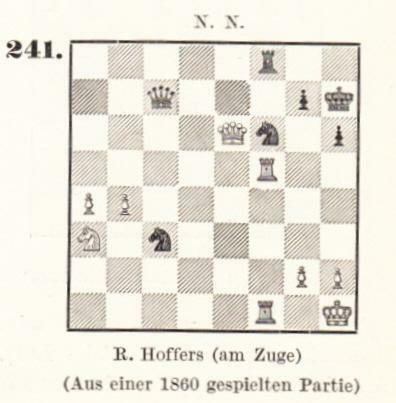 In later editions of Kombinationen it was position 271, but the information remained the same: Richter stated that R. Hoffers was White and that the game was played in 1860. It is unclear exactly how the word ‘früher’ (e.g. ‘some time ago’) should be interpreted. 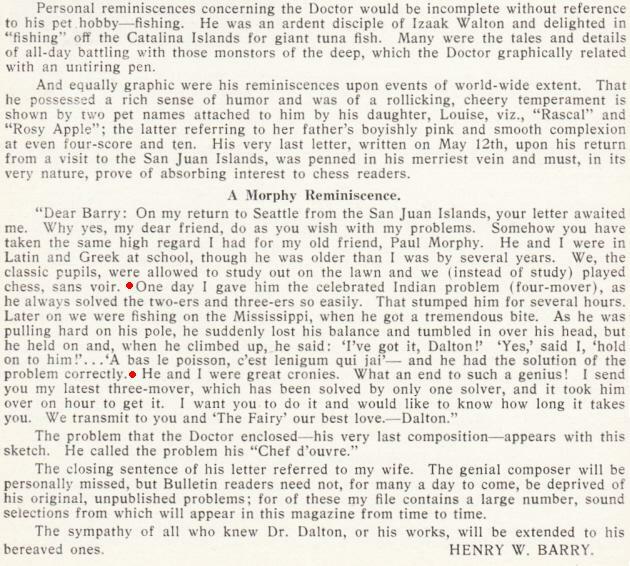 Certainly, the references to Hoffers in the German magazine were clustered around 1880, and we have found nothing about him or the position in any publication circa 1860. Inevitably, confusion has arisen between Hoffers and Hoffer. 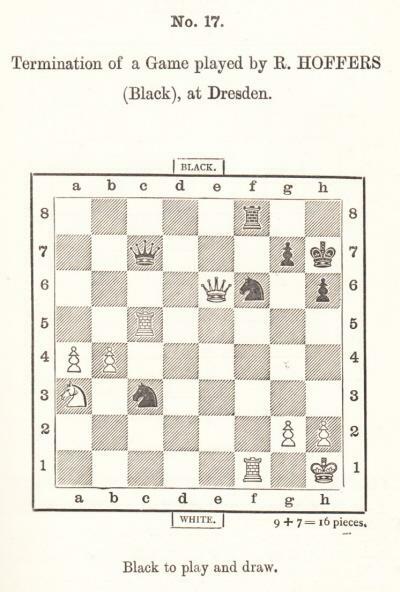 For example, page 42 of Chess Techniques by A.R.B. Thomas (London, 1975) labelled the ‘swindle’ position ‘Hoffer-N.N., 1860’. Other occurrences in print are sought. What, for instance, was the source for the starting position given by Richter (with the white rook on f5 and not yet on c5)? On the basis of the US Public Records Index and the 1930 United States Federal Census (both available at Ancestry.com) Russell Miller (Vancouver, WA, USA) provides information on Arthur A. Murray, who was born on 28 June 1921 in Washington State. 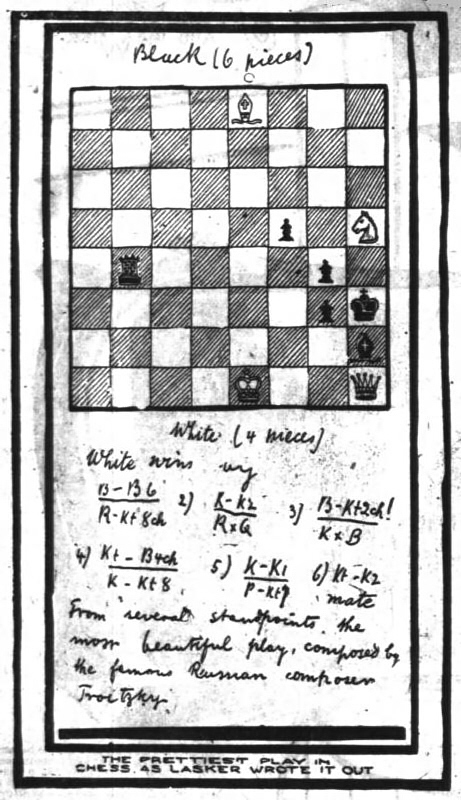 Just below the diagram there is a reference to the game Lipnitsky-Smirnov, played in the USSR Armed Forces Championship Semi-Final, Kiev, 1949. Source: page 158 of Impact of Genius by R.E. Fauber (Seattle, 1992). As shown in C.N. 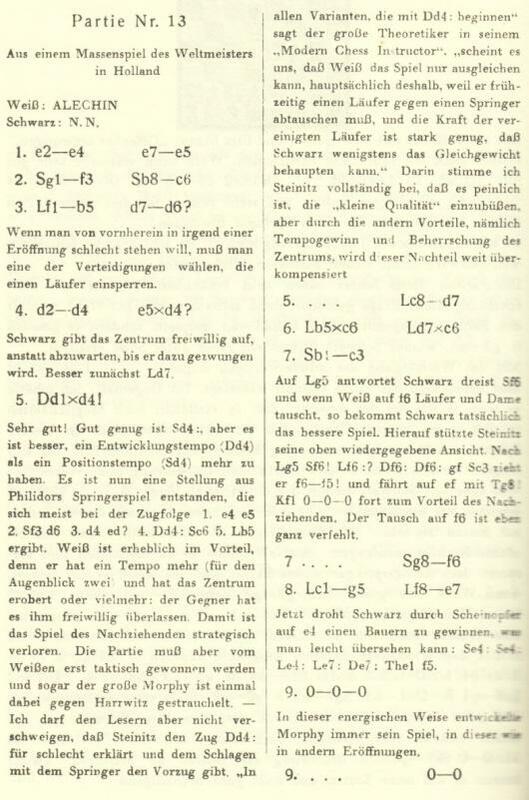 8169, page 159 of Schackvärlden, June 1936 stated that after 25...Qxd5 the players agreed to draw the game, although another five moves needed to be made. 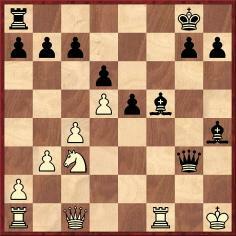 According to the magazine, Capablanca should have played 26...Rxa6 instead of 26...Rab8 ‘? 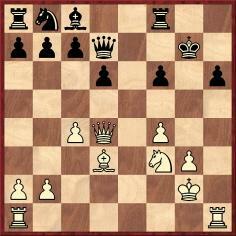 ?’, and Ståhlberg could have won with 30 Bxe5. 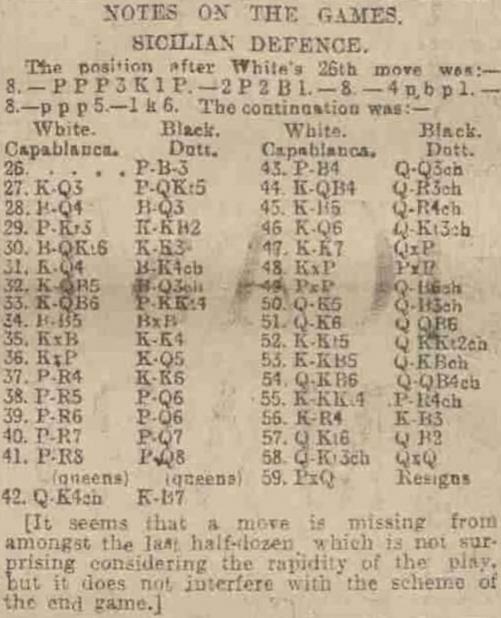 The ‘Chess Stars’ book on Capablanca mentioned in our earlier item gave 26 Rxa6 a question mark, suggesting instead 26 Qc2 ‘! ?’, with 27 Rd1 to follow. A question mark was also appended to 26...Rab8, the recommendation being 26...Nc5 ‘!’ 27 Rxf6 (if 27 Rxa8 Qxa8) 27...gxf6 28 Qg4+ Kf8, with a clear advantage to Black. 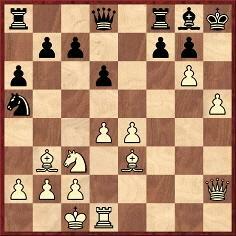 Instead of 30 h3 the book proposed 30 Bxe5 ‘!’ Re8 31 Bxf6 Rxe1+ 32 Qxe1 Qxf5 33 Bc3, with a clear advantage to White. 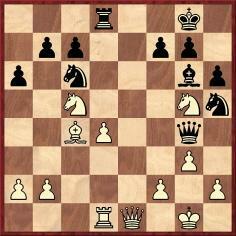 Schackvärlden commented on Ståhlberg’s gentlemanliness in adhering to the draw agreed earlier, but did he have a won game at any stage and, in particular, with Bxe5 at move 30? 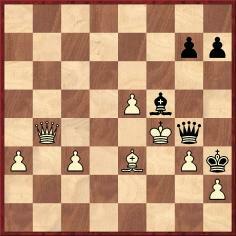 And how does all this tie in with the references in CHESS to Ståhlberg’s ‘slip which would have lost a piece’ and Capablanca’s ‘move which allowed the possible gain of a pawn’? Olimpiu G. Urcan (Singapore) supplies the handwritten applications to the Royal Literary Fund submitted by G.H.D. Gossip and B. Horwitz. 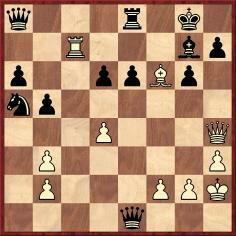 26 Nge6 Re8 27 Be2 Qf5 28 g4 Qf6 29 gxh5 Bf5 30 Nxc7 Qg5+ 31 Kh1 Bh3 32 Qg1 Rxe2 33 Qxg5 hxg5 34 d5 Ne5 35 d6 Rxf2 36 d7 Bxd7 37 Kg1 Rc2 38 Nxd7 Nf3+ 39 Kf1 Nxh2+ 40 Kg1 Nf3+ 41 Kf1 Rxc7 42 White resigns. An earlier game between the two players was given in C.N. 7216. 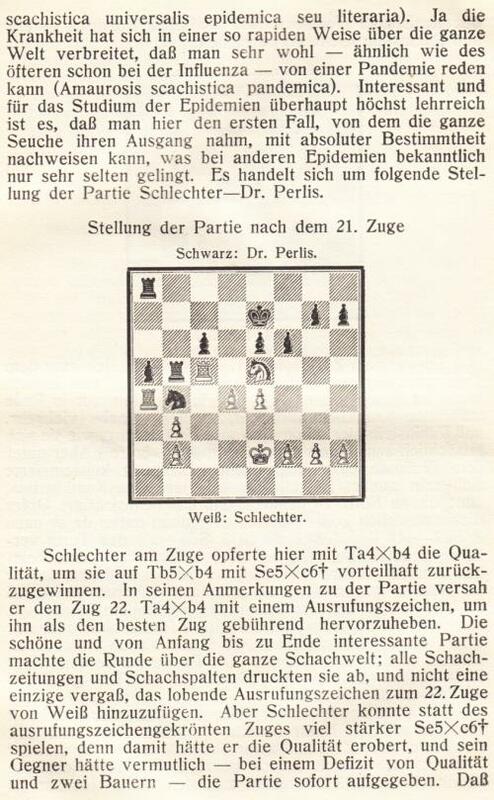 When was the first occurrence in print of Tarrasch’s term ‘amaurosis scachistica’ (chess blindness)? 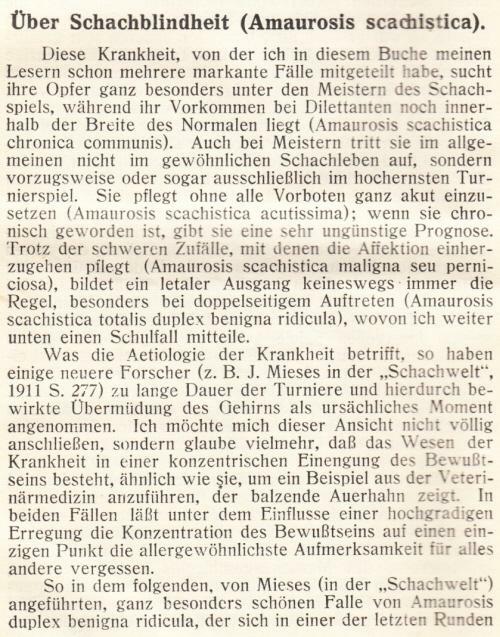 Is it possible to identify the newspaper in which the article on ‘amaurosis scachistica’ originally appeared? 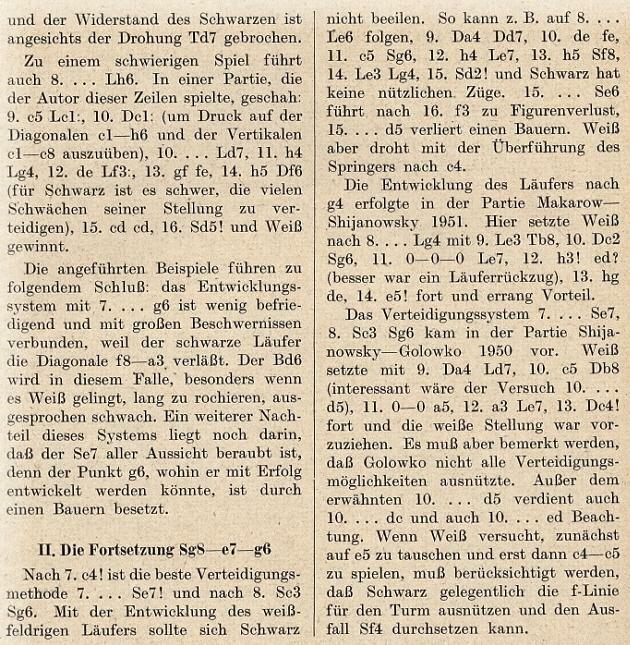 Tarrasch republished the article, with minor rewording, on pages 337-340 of Tarrasch’s Schachzeitung, 1 September 1933. 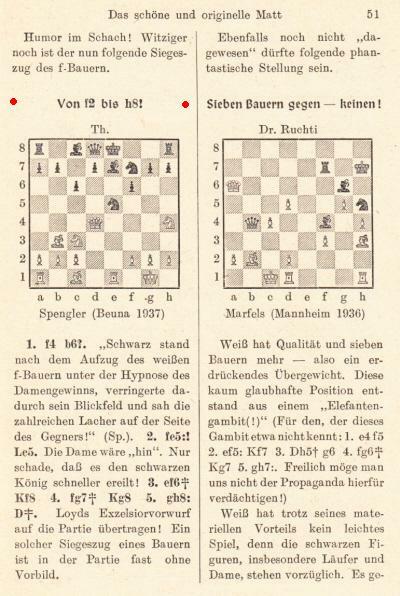 As regards English-language publications, the Latin term was mentioned in a review of Die moderne Schachpartie on page 159 of the July 1913 American Chess Bulletin, although rendered as ‘amaurosis schachistica’. An oft-seen spelling is ‘amaurosis scacchistica’, e.g. on page 174 of All About Chess by I.A. Horowitz (New York, 1971). 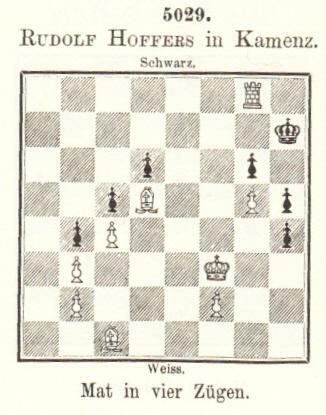 The composition, dated 1897 and with the knight on g6 instead of h5, is on pages 69-70 of Collection of Chess Studies by A.A. Troitzky (Leeds, 1937). ‘An amusing comedy of errors, to be sure. 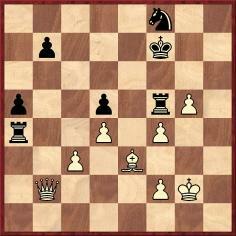 It seems quite dangerous to agree to a draw and then play on to a specified number of moves before stopping. 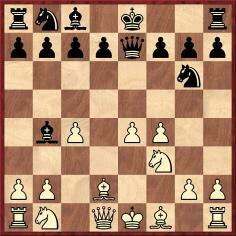 Certainly, 26 Rxa6 was a bad error, and with 26...Nc5 Capablanca could have turned the tables decisively. 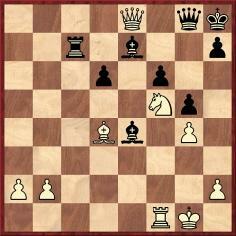 The immediate 26 Rd6 would still allow White to keep some advantage. 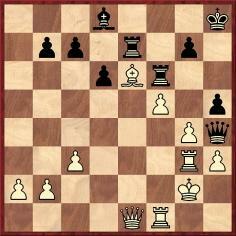 The favor was returned immediately by 26...Rab8, a bad move because 26...Nc5 is so much better. Instead of 27...Qb7 (?! ), either 27...Qc5 or 27...Qa5 would be better. 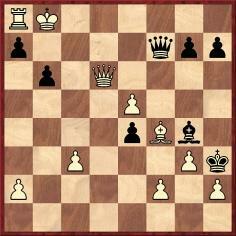 The disadvantage of 27...Qb7 is that the queen does not protect the d8 rook, which makes the pin on the d-file hard to disentangle. C.N. 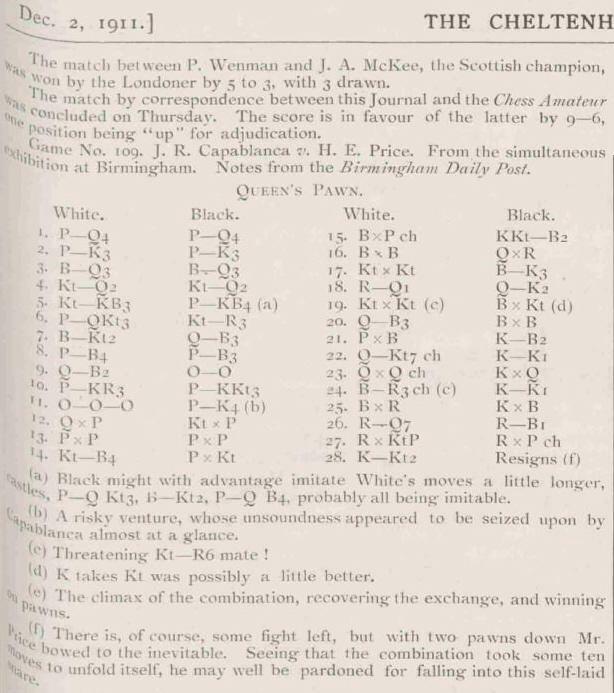 2195 (see page 134 of A Chess Omnibus) quoted from page 574 of the March 1882 issue of Brentano’s Chess Monthly a reference to P. Richardson being named ‘The Stormy Petrel’ by G.H. Mackenzie. See too Philip Richardson The Stormy Petrel of Chess by John S. Hilbert (Olomouc, 2009). 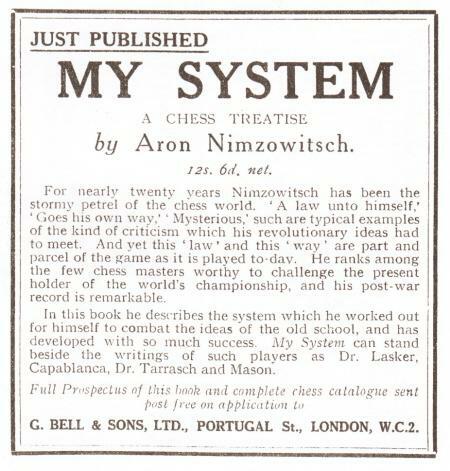 The description ‘stormy petrel’ in connection with Nimzowitsch is on page v of My System (London, 1929), at the start of the Translator’s Preface. 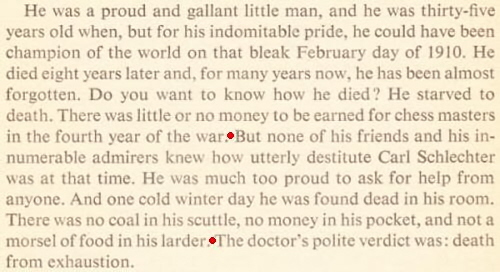 The translator was Arthur Hereford Wykeham George, using the pseudonym Philip Hereford (BCM, July 1937, page 361). Have any other languages taken up a name such as ‘stormy petrel’ in connection with Nimzowitsch, Richardson or any other player? 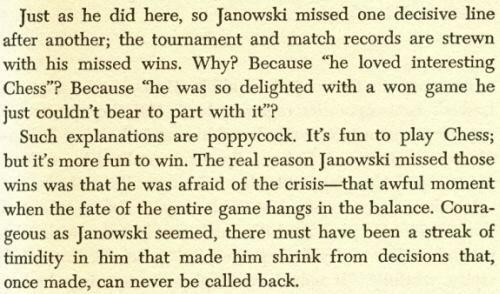 Christian Sánchez (Rosario, Argentina) quotes the above remark by Botvinnik from page 40 of the 0/1984 issue of New in Chess (in a feature, ‘Botvinnik speaks out’, on pages 36-43). The highlight of issue zero is a most extraordinary interview with Botvinnik. 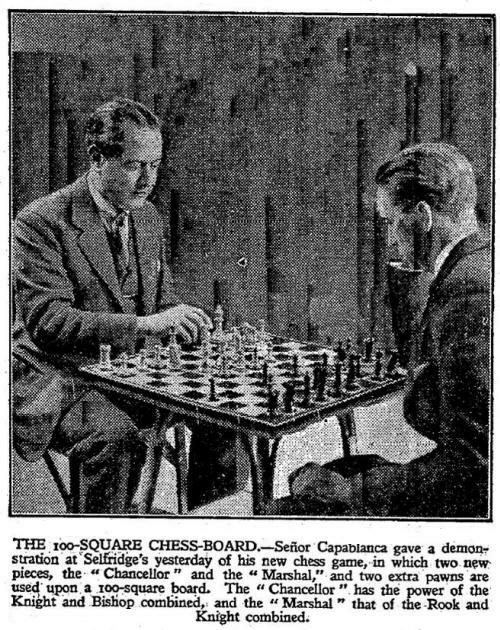 Our eye homed in on a quote, ‘Capablanca was a genius, the greatest genius in the whole history of chess’, and we at once felt well-disposed to the former world champion, ‘Mr Soviet Chess’. 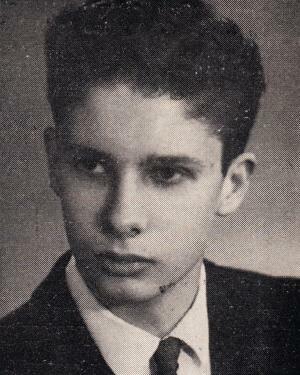 But the rest of the material makes Botvinnik a difficult man to like, the interview being a supreme example of high bitchery. Up until a few years ago Botvinnik was a dull case for historians, psychologists, etc., but his recent writings and interviews reveal an unknown, or neglected, side of his character. The interview is an amazing document, and a memorable scoop for New in Chess. 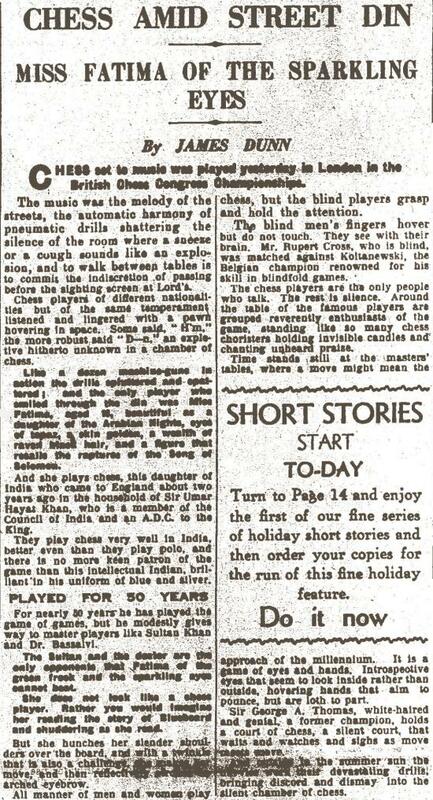 Daily Mail, 24 January 1938, page 7. ‘... The author ventures the suggestion that there is a lot of nervousness among the players of Black – a nervousness which is unjustified. 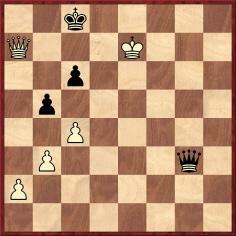 If White is a better colour than Black, then let us all give up chess! What is the truth of the matter? First, White has an initiative. In certain well-recognized lines of play, which Black may feel it necessary to adopt (e.g. defences to the López), that initiative lasts a long time. But an initiative must not be confused with an advantage. There is no opening in which White, without sacrificing unsoundly, can prevent Black achieving full development. When that is achieved, it may well be a better development than White’s, because it is a subtler one; in the interstices of a rigid position. 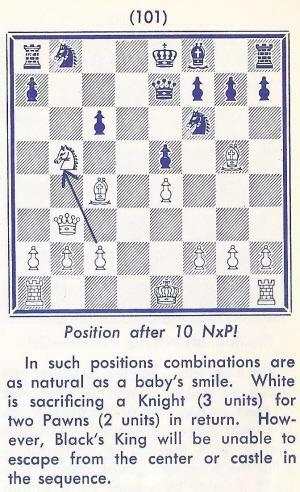 Source: page 275 of The Handbook of Chess and The Pan Book of Chess by Gerald Abrahams (London, 1965). It would seem that identification of the players can only be guesswork. Most C.N. items mentioning Irving Chernev have concerned chess history and lore, but he was an exceptionally entertaining annotator. 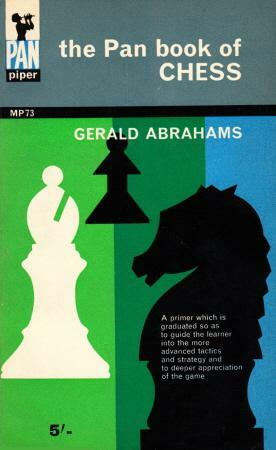 The Most Instructive Games of Chess Ever Played was published by Simon and Schuster, New York in 1965 and by Faber and Faber, London the following year. The US publishers also brought out a Fireside paperback edition (undated), and in 1992 the work was reprinted by Dover Publications, Inc., New York. An algebraic version has yet to be produced and would be very welcome. 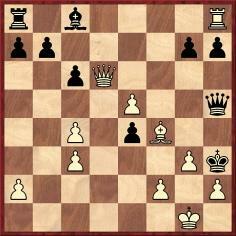 Game 45 in Chernev’s The Most Instructive Games of Chess Ever Played is ‘S. Tarrasch-S. Vogel, Nuremberg, 1910’. 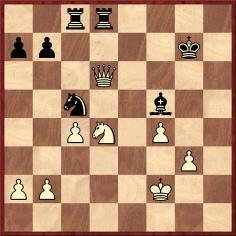 Under the heading ‘The Galloping Knight’, it is described as ‘superb position play by a master in that domain’. 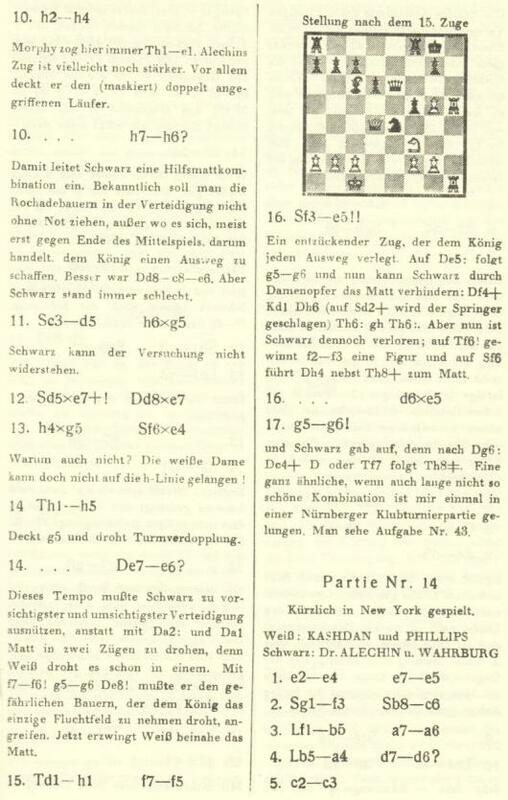 The game was the second of three (numbers 4, 7 and 114) between the two players in Tarrasch’s Die moderne Schachpartie (first published in 1912). 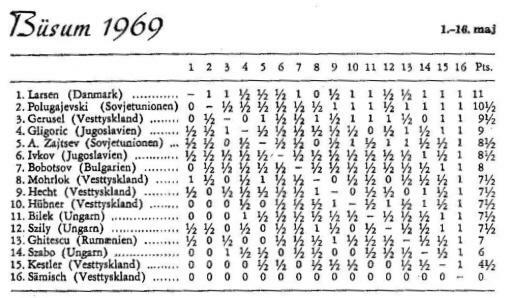 All were played in Nuremberg, game 4 in 1910 and game 114 in 1909. 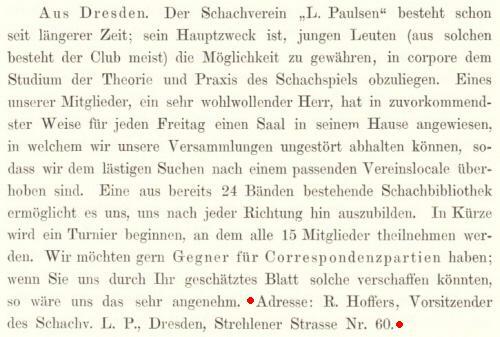 Tarrasch provided no details regarding the occasion, and in each case his opponent was named only as ‘Herr Vogel’. 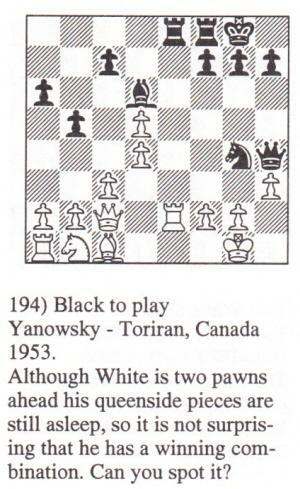 On the other hand, when two of the encounters were given in Tarrasch’s Best Games of Chess by Fred Reinfeld (London, 1947) Black was named as ‘S. Vogel’ each time. 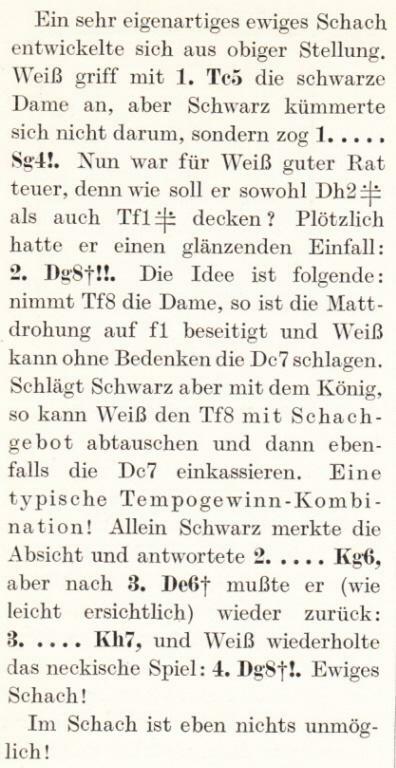 It is unclear whether Tarrasch’s opponent was the Vogel who participated in a tournament in Nuremberg in 1888 (Deutsche Schachzeitung, September 1888, pages 262 and 265). No other information about him was given there beyond ‘Vogel (Nürnberg)’. Can readers help us to build on these preliminary findings? 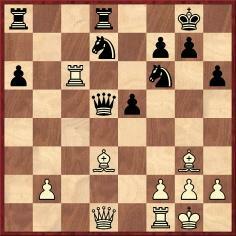 24 h6 Nxb3+ 25 axb3 Qd7 26 hxg7+ Kxg7 27 Bh6+ Kf6 28 Qh4+ Ke6 29 d5+ Ke5 30 Qf4 mate. Unsurprisingly, the FatBase database ascribed the victory to Savielly Tartakower. 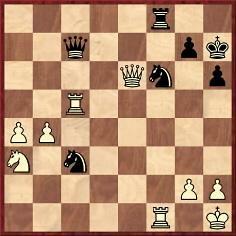 What is to be made of the reference to Capablanca? 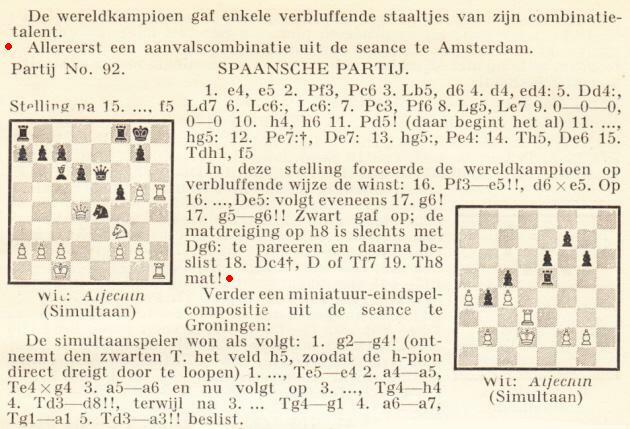 A new feature article, The Laws of Chess (1912), reproduces the text from the booklet, as well as E.E. 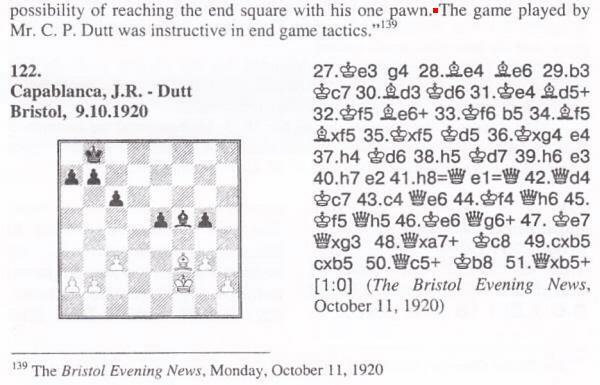 Cunnington’s critique and other material from the Chess Amateur. 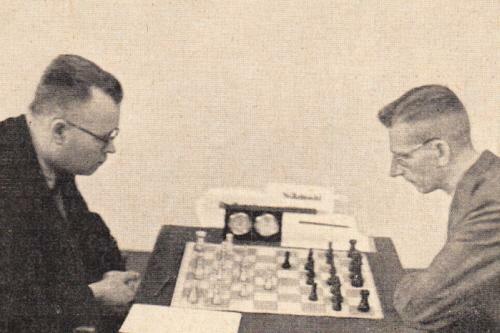 Thomas Höpfl (Schkopau, Germany) and Dan Scoones (Port Coquitlam, BC, Canada) point out a video item featuring Euwe and Alekhine (1935) which is similar, but not identical, to one available in Chess Masters on Film. 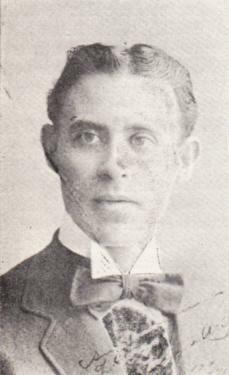 From Thomas Höpfli there also comes a link to a video report on Arturo Pomar which includes Fischer speaking a few words of Spanish. But then there is the difficult/worthwhile way, which entails trying to keep abreast of research, presenting the known facts accurately and endeavouring to establish the truth. 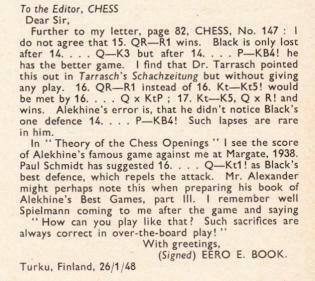 See, however, Tarrasch’s note to 14...Qe6, given earlier in the present item. 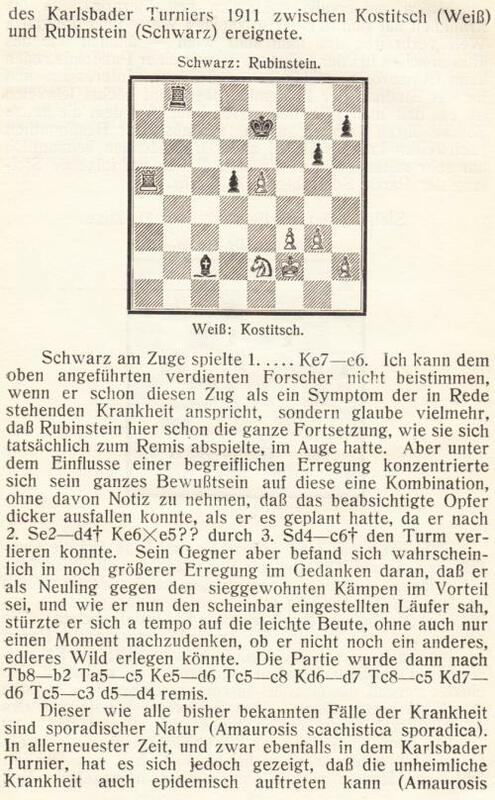 We add that Böök’s account was discussed on pages 120-122 of The Pleasures of Chess by Assiac (New York, 1952). 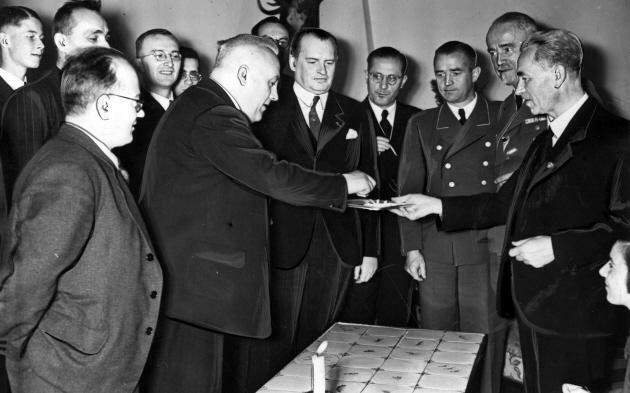 At present, no tidy conclusions seem possible about the identity of Alekhine’s opponent, beyond the observation that, for the past two decades, competent writers have not named him unquestioningly as Mindeno. 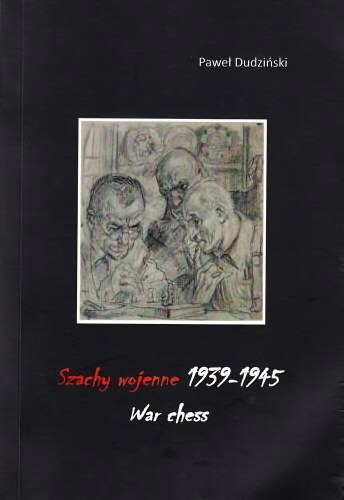 Paweł Dudziński (Ostrów Wielkopolski, Poland) has sent us a copy of his book Szachy wojenne 1939-1945 War chess (Ostrów Wielkopolski, 2013). Richly illustrated with games, photographs and documents, the historical narrative is remarkably detailed. The work is a 299-page soft-cover publication in Polish, with a summary in English on pages 273-277. 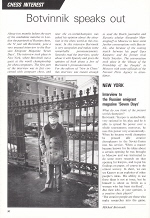 Mr Dudziński has authorized us to reproduce here a number of photographs, and the scans provided by him are accompanied below by the book’s captions. Only a limited number of copies of this exceptional (and, we understand, inexpensive) book are available, and we shall be pleased to forward to the author any messages from readers who wish to buy it. 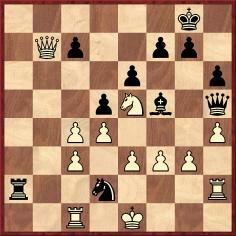 Play went 1...Ng4 2 Qg8+ Kg6 3 Qe6+ Kh7 4 Qg8+ Drawn. 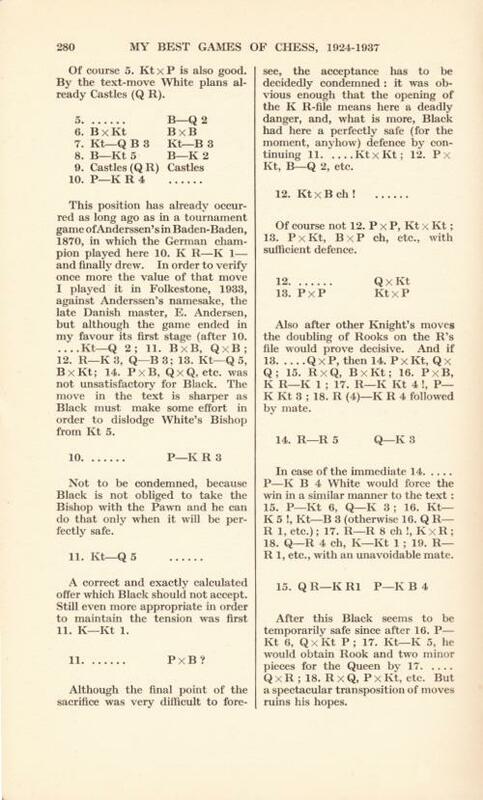 No further details have yet been traced concerning this nineteenth-century game involving R. Hoffers. 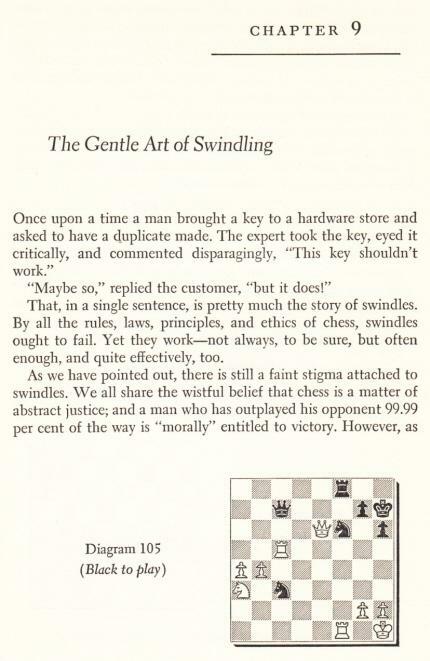 However, Richard Forster (Zurich) considers that the Horowitz and Reinfeld book was incorrect to classify the play as a ‘swindle’. There was no element of luck, such as a move or plan which worked only because the opponent did not see through it in time. 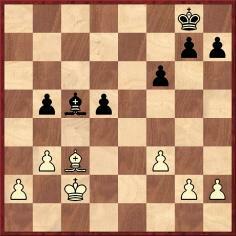 Both sides simply played the best moves, and the spectacular draw by perpetual check was the fair outcome. 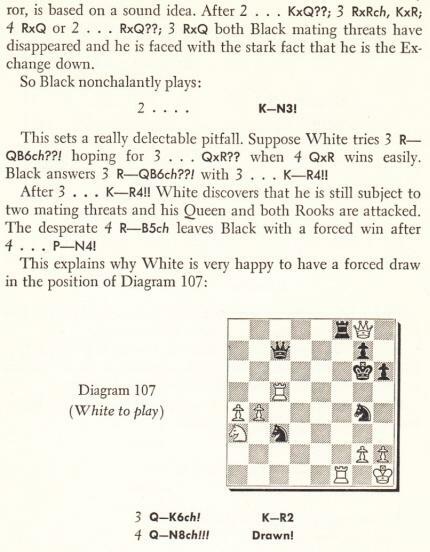 Our correspondent adds that Black’s unknown move before Rf5-c5 could be called a swindle if it provoked White to err with the move Rf5-c5, but that was not the thrust of Horowitz and Reinfeld’s text. The event was the Premier Reserves tournament, but we have yet to find the game-score. Wolfgang Franz (Oberdiebach, Germany) notes that the photographs in C.N. 8204 can be viewed, together with many others, at the Polish Zbiory NAC on-line website, e.g. by searching for Szachowe or Alechin. ‘There are two examples on page 192 of A.J. 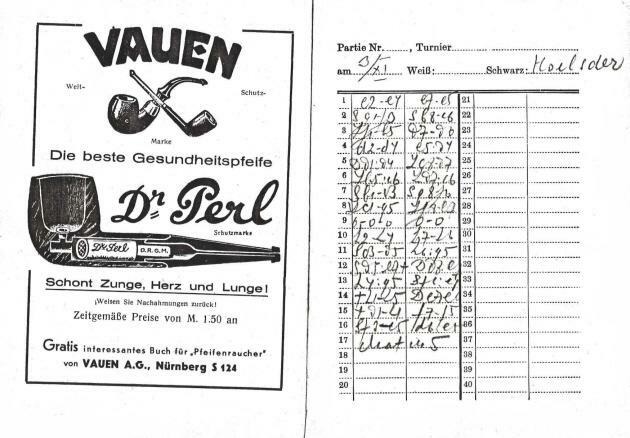 Roycroft’s Test Tube Chess (London, 1972): “Erler v Altwein, East German Junior Championship, 1969” and “H. Westerinen v Y.E. Westman, Uppsala, 1969”. 96...h5 96 Kd6 h4 97 Kxc6 h3 98 Kd7 h2 99 c6 h1(Q) 100 c7 Qb7 101 Kd8 Kf6 102 Kd7 Ke5 103 Kd8 Kd6 104 c8(N)+ Ke6 105 White resigns. 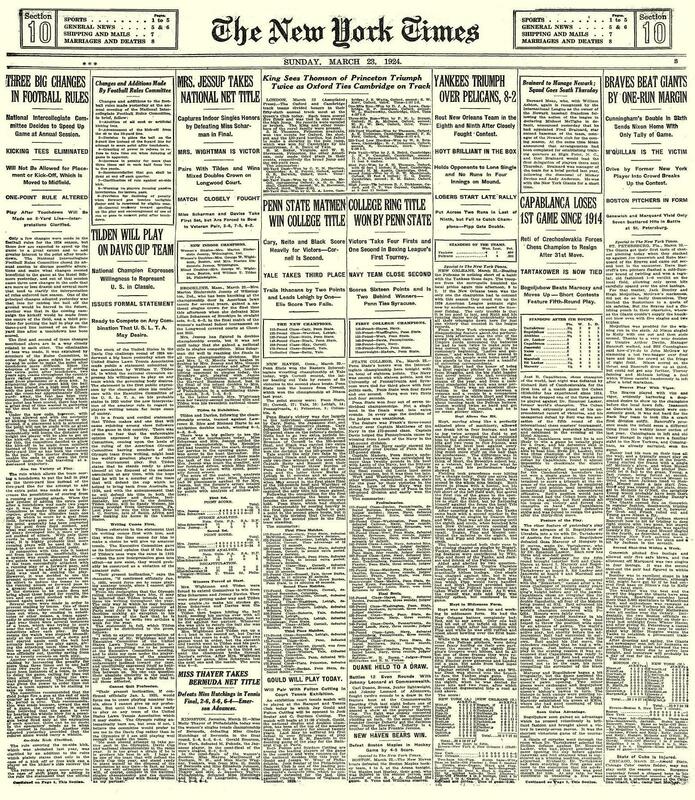 Sources (full game-score): BCM, March 1913, pages 113-115, and Wiener Schachzeitung, February-May 1914, pages 125-128. The note came after 1 e4 e5 2 Nf3 Nc6 3 Bb5 Nf6 4 O-O d6 5 d4 Bd7 6 Nc3 Be7 7 Re1 exd4 8 Nxd4 O-O in Tarrasch v Lasker, second match-game, 1908. The image of a curled-up hedgehog was used by Nimzowitsch on pages 70 and 115 of Die Praxis meines Systems (Berlin, 1930); see pages 100 and 163 of The Praxis of My System (London, 1936). 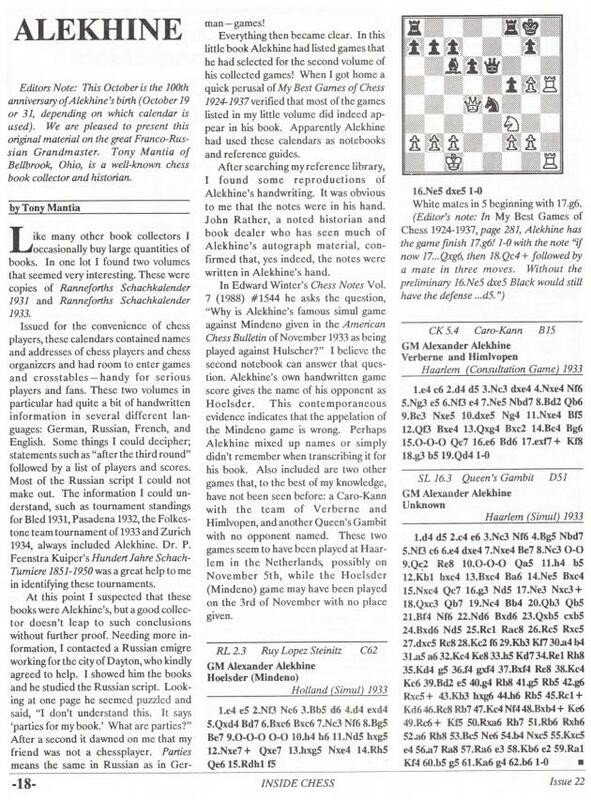 He was reporting on a series of articles by Albrecht Buschke in Chess Life in 1950 which had demonstrated that the ‘five queens’ play given by Alekhine in a note to Game 26 in his first volume of Best Games was spurious. 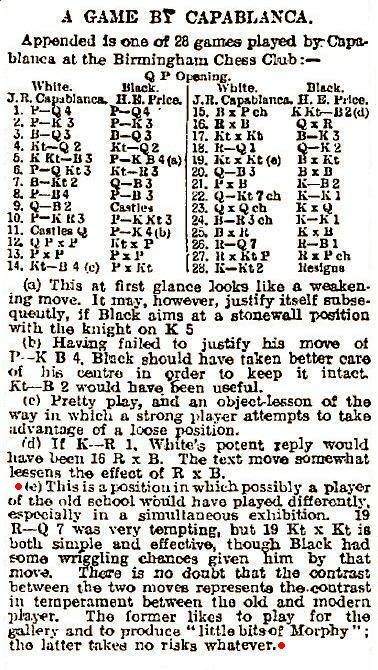 C.N.s 326 and 387 touched on the matter, and since then it has been analysed in detail by Tim Krabbé, on pages 54-64 of Chess Curiosities (London, 1985) and on his website. 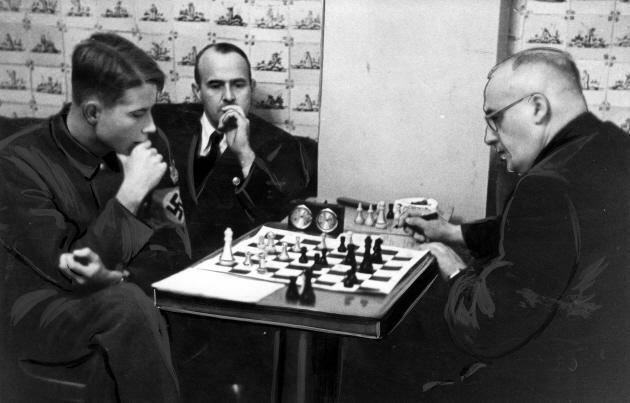 The case is regularly cited as an example of Alekhine’s ‘dishonesty’. 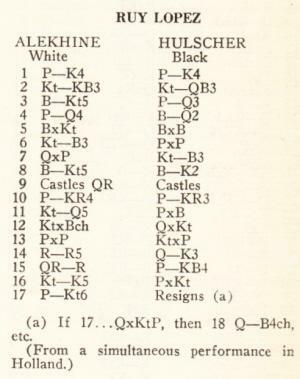 How is it possible that, even today, there are authors who state that Alekhine won such a game? The latest instance noted by us is on page 381 of Best Play by Alexander Shashin (Newton Highlands, 2013). 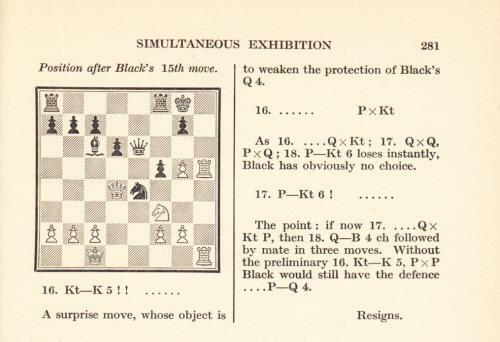 Page 365 of A. Shashin’s Best Play has a position headed ‘Capablanca-Baca, La Habana (blindfold), 1912’. 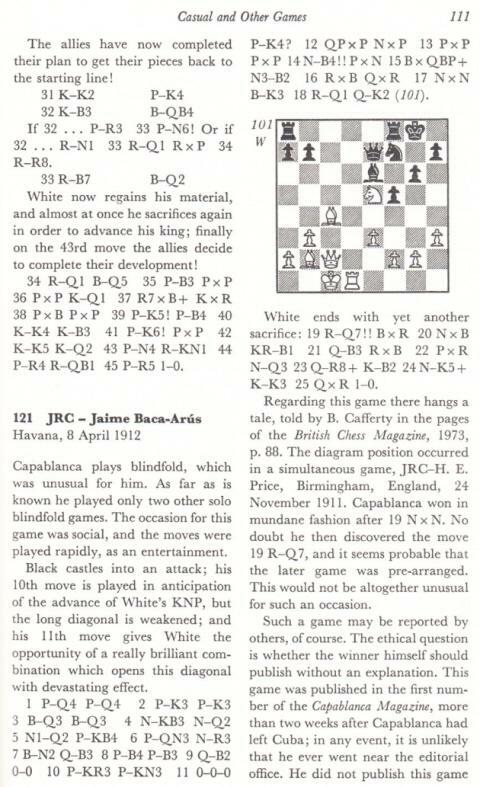 Baca-Arús was not named when the game was given in the Euwe, Harley, Reinfeld and Réti books or, for example, in Homenaje a José Raúl Capablanca (Havana, 1943). Nor did the word ‘blindfold’ appear. 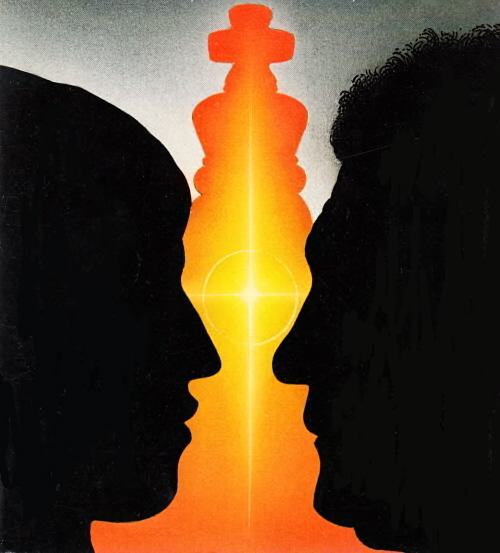 The same applies with regard to the full page (page 232) which the tactical play received in Combinations The Heart of Chess by Irving Chernev (New York, 1960). 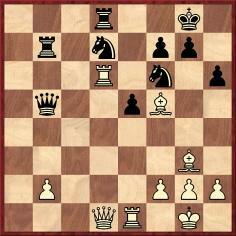 With the exception of Harley’s book, all these works broke off the game after White’s 22nd move. Harley continued to move 25 but with a different finish from that given in Capablanca-Magazine and The Unknown Capablanca: 22...Nd8 23 Qh8+ Kf7 24 Qg7+ Ke6 25 Nf8+ Resigns. 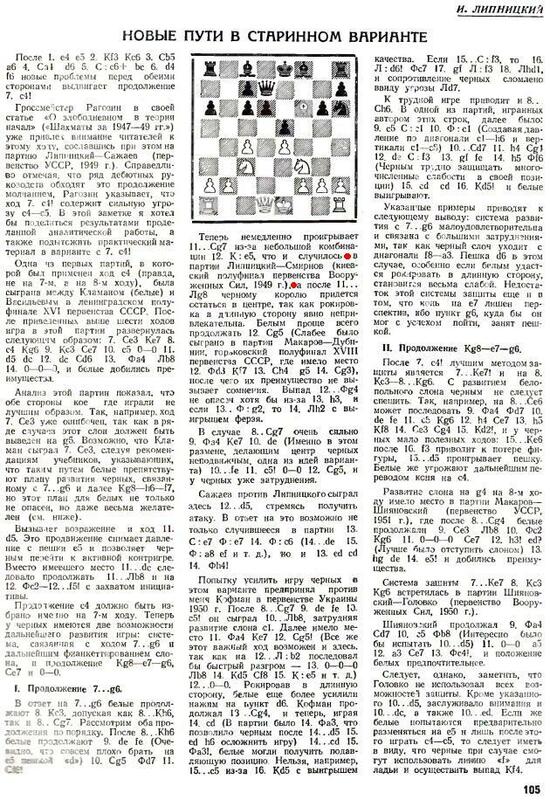 So wrote Valery Salov on page 21 of the 5/1989 New in Chess regarding 19 Nxe6 in Kasparov v Salov, Barcelona, 1989. Salov’s remark is quoted on page 258 of Garry Kasparov on Garry Kasparov Part II: 1985-1993 (London, 2013) in a slightly different wording (‘I think it was Reuben Fine who wrote ...’). 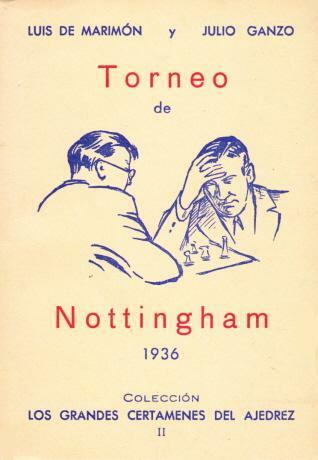 The game was Rellstab’s victory over Alekhine at Munich, 1942, although in the heading (page 193) Fine put ‘Monaco’, an error corrected when the article was reproduced on pages 135-141 of his book Chess Marches On! (New York, 1945). ‘Some UK Incoming Passenger Lists (1878-1960) have recently been indexed. There are records of eight occasions when Capablanca arrived in England: 14 February 1911 (Liverpool), 10 October 1913 (Southampton), 2 August 1919 (Southampton), 19 October 1925 (Southampton), 26 March 1929 (Southampton), 11 June 1931 (Plymouth), 23 December 1934 (Liverpool) and 10 April 1936 (Plymouth). On arrival in 1934 he gave as his address in the United Kingdom the Cuban Legation, 30 York Terrace, London NW1. 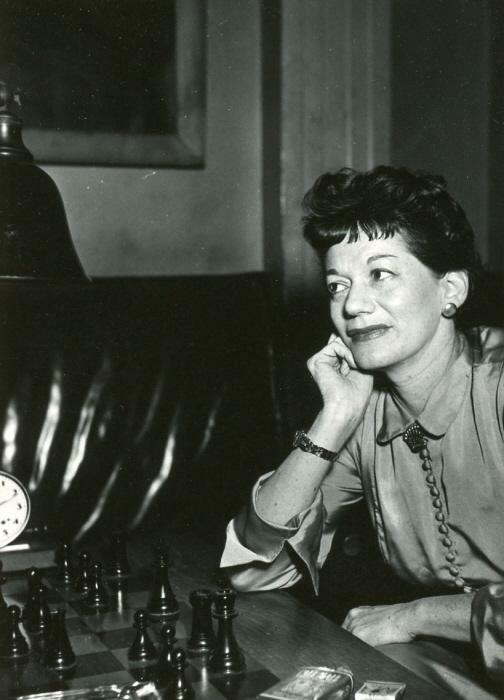 When Alexander Alekhine arrived at Southampton on 19 April 1938 he was accompanied by Grace Alekhine, whose age was given as 51. They had come from Buenos Aires, and both were listed as residents in France. The address specified in the United Kingdom was the Grand Hotel, Cliftonville, Margate. Tomasz Lissowski (Warsaw) reports that Arthur Tartakower is buried in Kotowice Cemetery. Source, found by Marek Lis (Opoczno, Poland): page 251 of Wielka Wojna na Jurze by P. and K. Orman (Cracow, 2008). 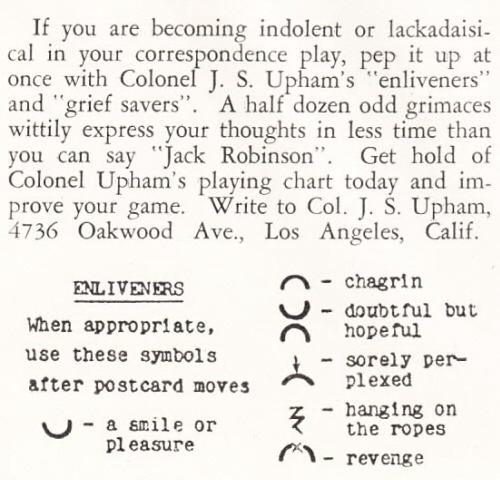 L. Evans, on page 270 of Chess Life & Review, May 1970. 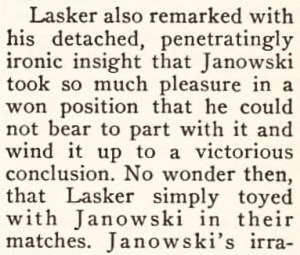 L. Evans, on page 29 of Evans on Chess (New York, 1974). The Facts about Larry Evans quotes four publications where he gave as his own work a 50-word passage about Rubinstein which had been written by Irving Chernev. ‘Thomas – Mitchell’; Black’s name was Michell. 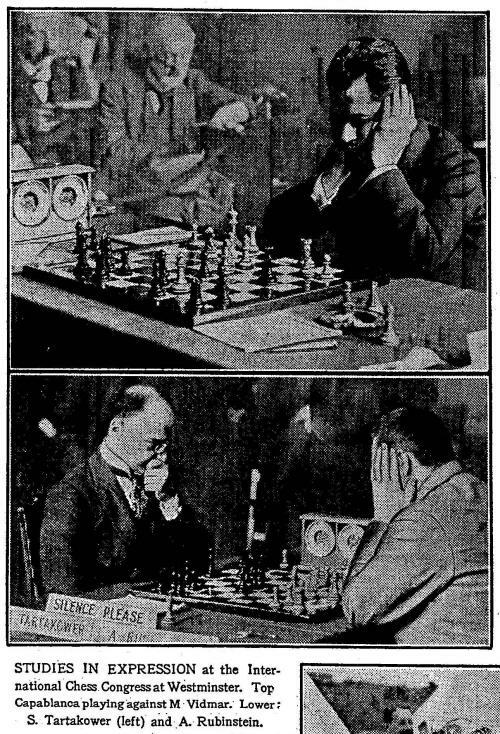 ‘London, 1932’; the game was played at the Hastings, 1932-33 tournament. 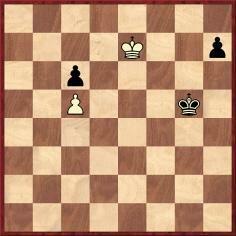 Wrong diagram, since the pawn at c5 should be black. 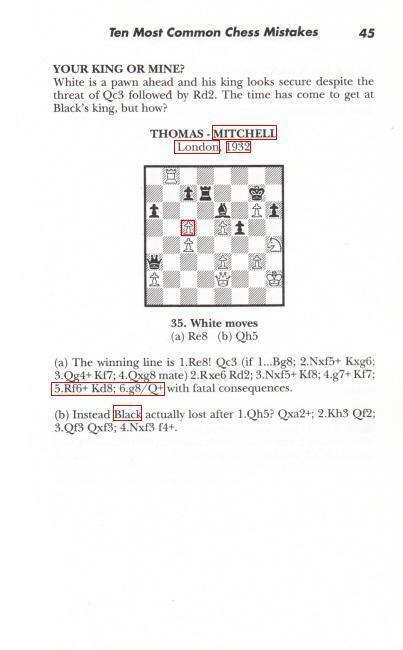 In his paragraph (a) Evans omits mention of the faster win 5 Re7+. 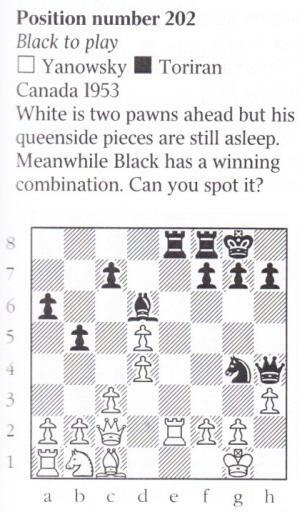 In his paragraph (b) he writes ‘Black actually lost’, whereas Black actually won. 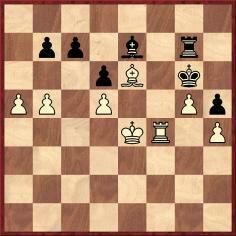 In this position there are errors by Evans which duplicate what was on page 317 of The Personality of Chess by I.A. 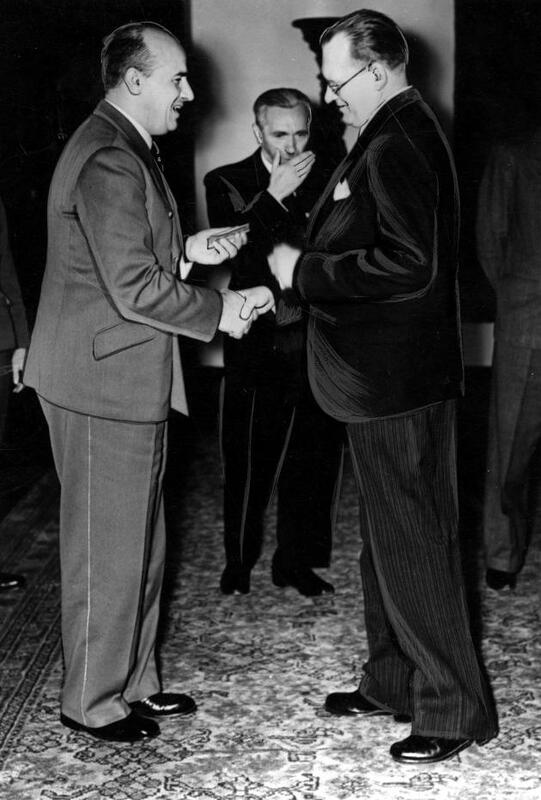 Horowitz and P.L. Rothenberg (New York, 1963). 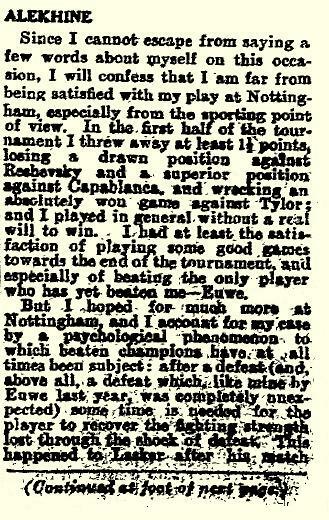 Our correspondent asks if Alekhine’s exact words can be found. ‘We are informed by B.S. 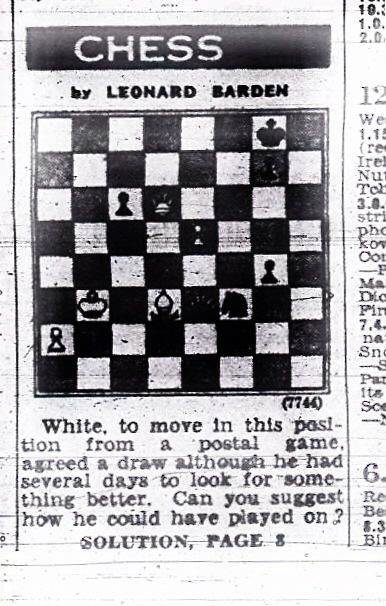 Brown, now an officer in the RAF temporarily in Canada, that a village chess club at Charfield is flourishing. It was founded in 1933. Its list of 39 members contains many prominent names, among them Mr Evelyn Waugh, now on active service. The proportion of members on active service is very high, more than a third in fact. Ryan Paulis (Amsterdam) notes the high prices being charged on the Internet for No Regrets by Y. Seirawan and G. Stefanovic (Seattle, 1992). On abebooks.com a vendor in Merchantville, NJ, USA is asking $1,250 for the hardback edition in ‘very fine’ condition. The original price of the book, published in December 1992, was $34.95 (or $24.95 for the softback edition). 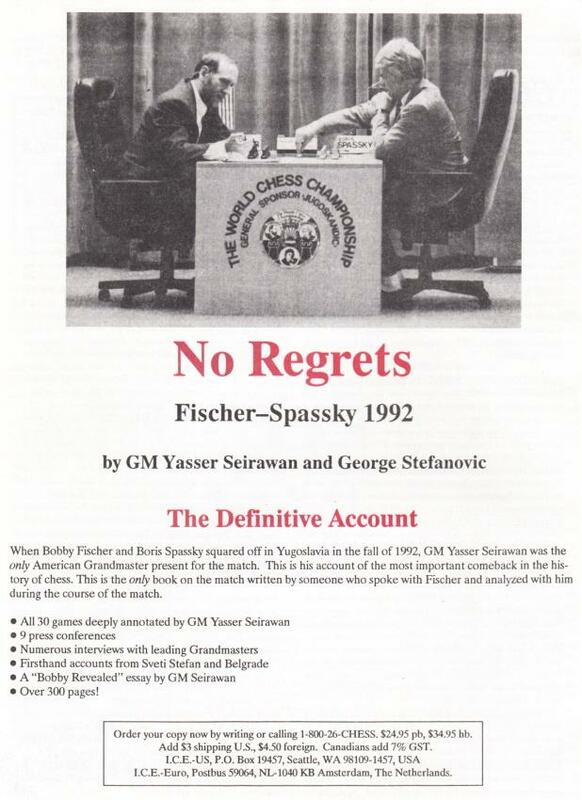 No Regrets, by far the best book on the 1992 Fischer v Spassky match, is indeed hard to come by nowadays, but there is little logic in chess book prices on the Internet. 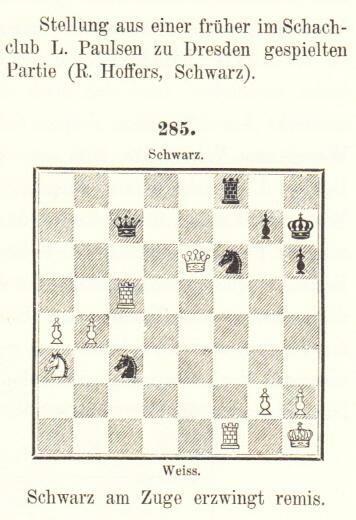 C.N.s 2308 and 2329 (see page 149 of A Chess Omnibus) touched on the subject, although mainly in the context of signed works. Here we add, at random, the example of a fairly recent book. 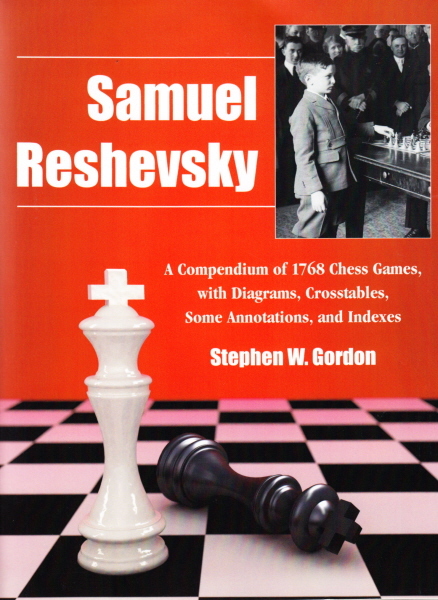 A mint copy of the paperback edition of Samuel Reshevsky by Stephen W. Gordon can be bought direct from McFarland & Co., Inc. for $45, whereas a second-hand copy is being offered on abebooks.com for nearly $230 by a Texas bookseller (named ‘ExtremelyReliable’). General dealers may cause inflation by copying, or worse, each other’s prices, regardless of considerations of quality or scarcity. Given this indiscriminate greed, with many a wet finger in the wind, no self-respecting author would boast about how much is being charged for his books by such people. 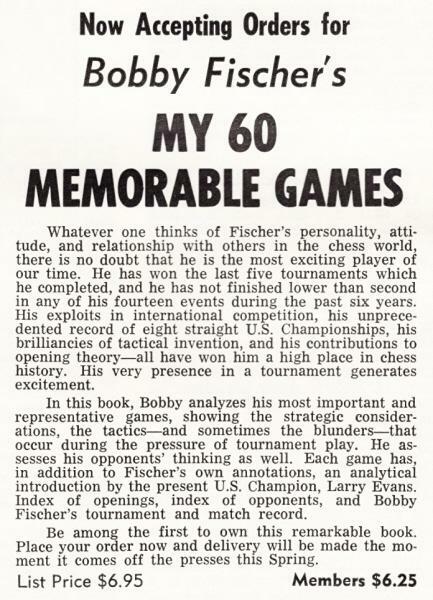 The availability of Fischer’s book in the United States Chess Federation’s inventory was announced on page 150 of the April 1969 Chess Life, and the magazine’s Editor, Burt Hochberg, wrote a detailed review on pages 235-236 of the June 1969 issue. 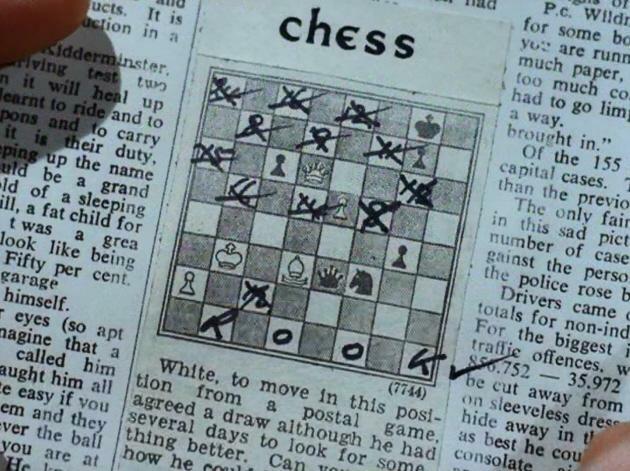 But what about the United States’ other major chess magazine of the time, Chess Review (Editor: I.A. Horowitz)? 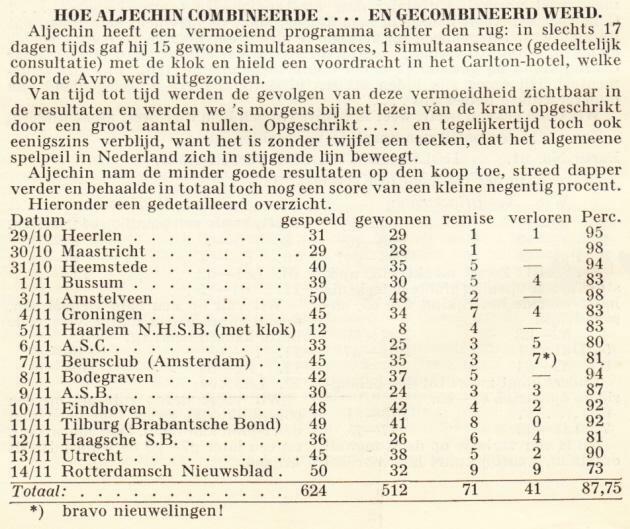 We have searched in vain throughout the 1969 volume of Chess Review for the slightest mention of My 60 Memorable Games. Why was it ignored? 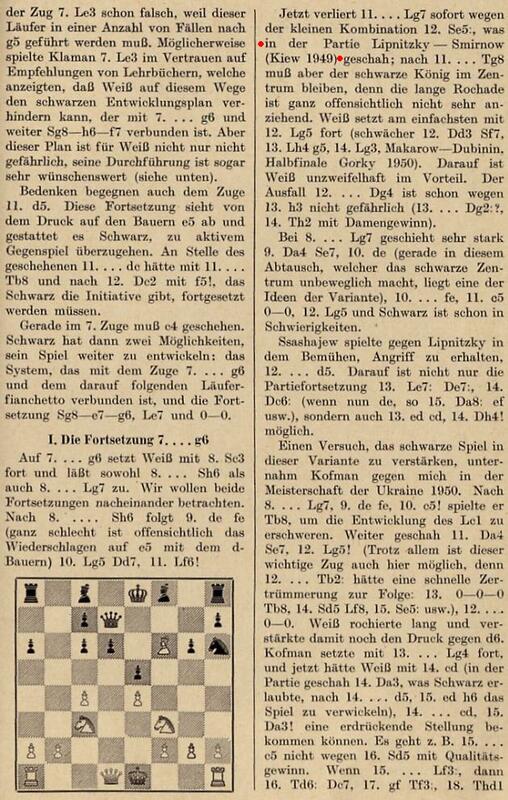 Chess literature has many references to F. Sämisch’s results at Büsum (Germany) in May 1969 and at Lidköping (Sweden) in July-August 1969, and especially concerning the quantity of games he lost by exceeding the time-limit. Can the key facts be summarized? 21...Qxf3 22 Nxf3 Nxf3+ 23 Kd1 Rxh2 24 Qa8+ Kh7 25 Ra1 Bd3 26 Kc1 Nd2 27 Qa4 Nxc4 28 Qd1 Be4 29 Qe1 Rc2+ 30 Kb1 Rxc3+ 31 Ka2 Ra3 mate. 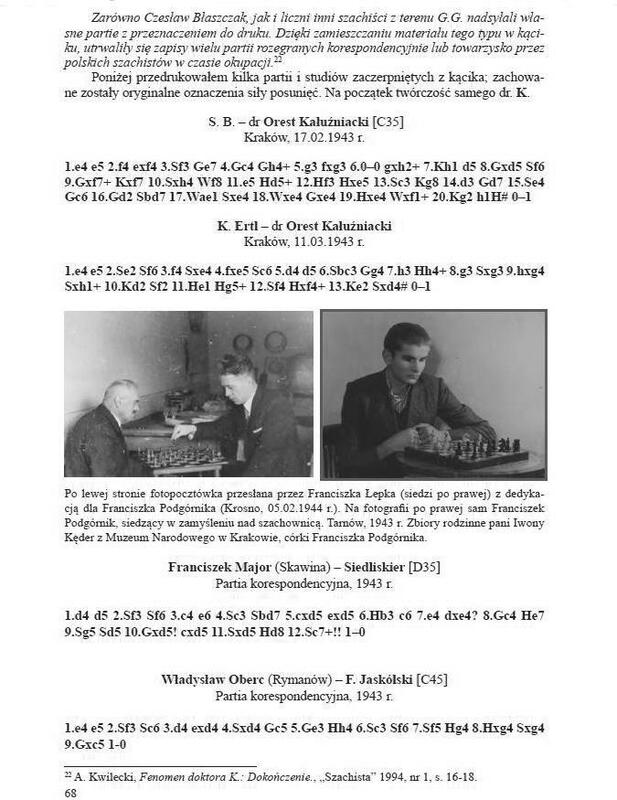 When the game was published on pages 175-176 of Ambasador Šaha by D. Bućan, P. Trifunović and A. Božić (Belgrade, 1966) White’s name was given as ‘Asian’, and the heading also stated ‘Meksiko Siti, 1930’. 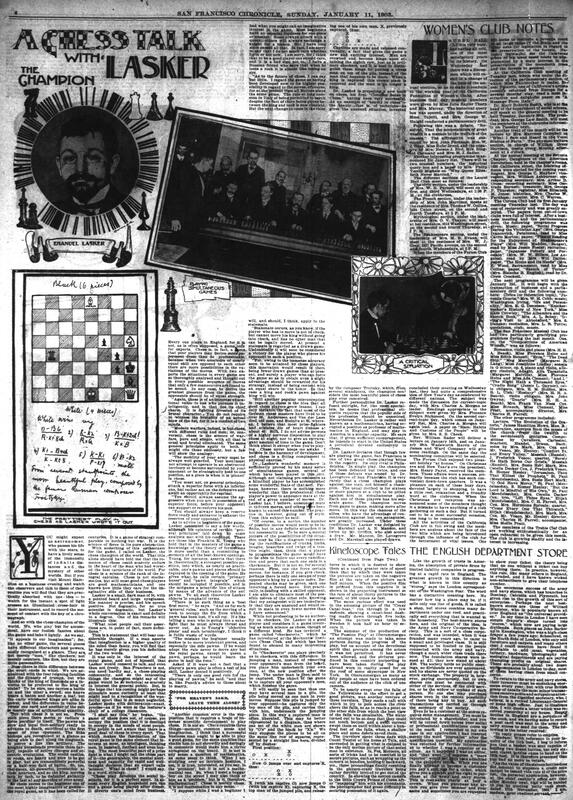 Page 112 of the July-August 1930 American Chess Bulletin reported that Kostić ‘is at present in Mexico City, where, we understand, he is fulfilling a six months’ engagement teaching chess to Mexican army officers’. 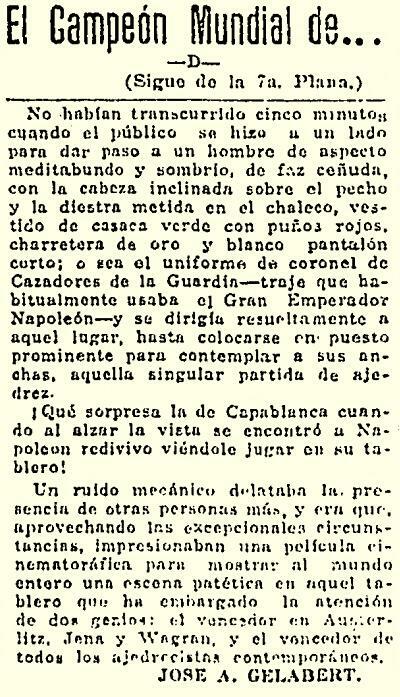 His visit to Mexico City was also mentioned on page 149 of the September-October 1930 Bulletin. 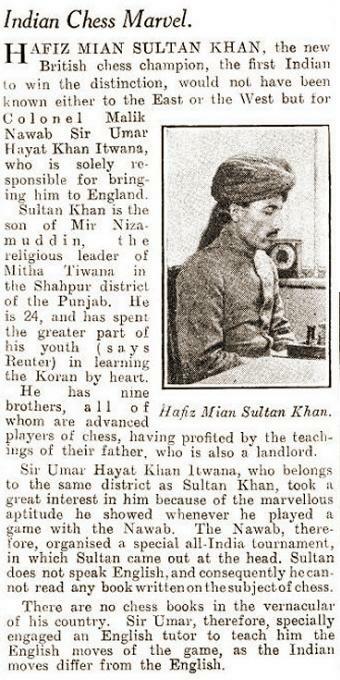 In December he travelled to St Louis in the United States for chess engagements (December 1930 issue, page 187). 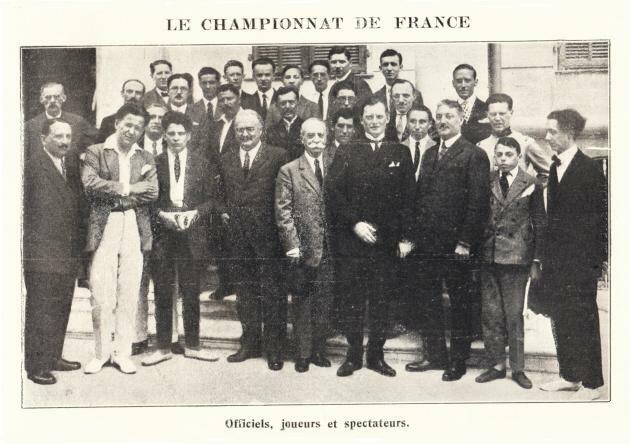 Who has been the youngest editor of a chess magazine? The Magdeburger Schachzeitung can be read on-line. 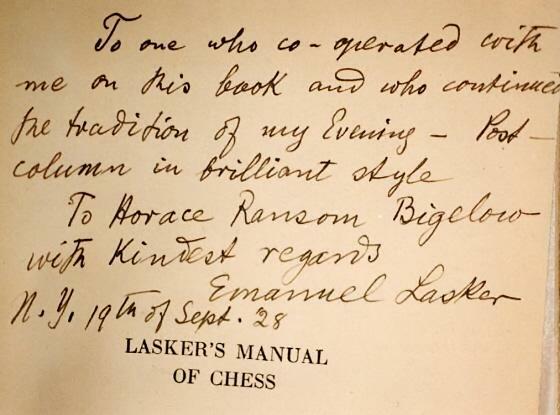 ‘For the first American edition of Lasker’s Manual of Chess he compiled a very comprehensive index, which, strangely, in later editions was either suppressed or plagiarized without mentioning his name. It is unclear which editions of the Manual Albrecht Buschke had in mind when referring to suppression and plagiarism. Bigelow was credited on page 377 of the original edition (published by E.P. Dutton & Company, New York in 1927), and on pages 375-376 he contributed an explanatory text entitled ‘Introduction to Index’. As regards the 1932 edition, published by Printing-Craft Limited, London, the text and index were different, and there was thus no reason for Bigelow to be mentioned. Later editions of the Manual (a revision by Reinfeld published by David McKay Company in 1947 and reprinted by Dover Publications, Inc. in 1960) are based on the 1932 edition. 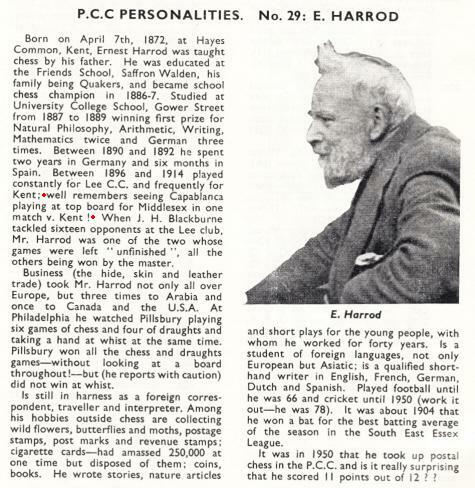 The column was recognizable as Leonard Barden’s in the London Evening Standard, and it was subsequently established that the position was from a correspondence game (Niels Lie v Arne Desler) played in the early 1930s. The sequence of C.N. 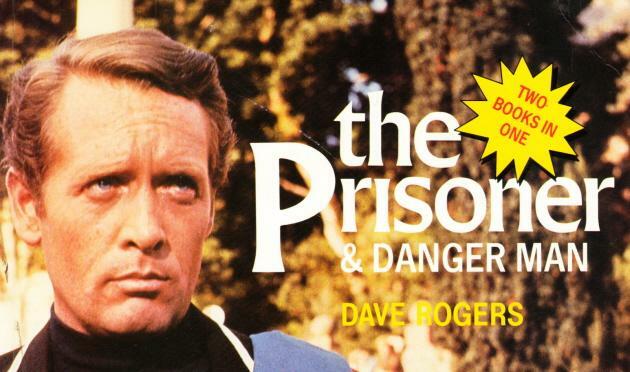 items has now been brought together in a feature article, Chess and The Prisoner. 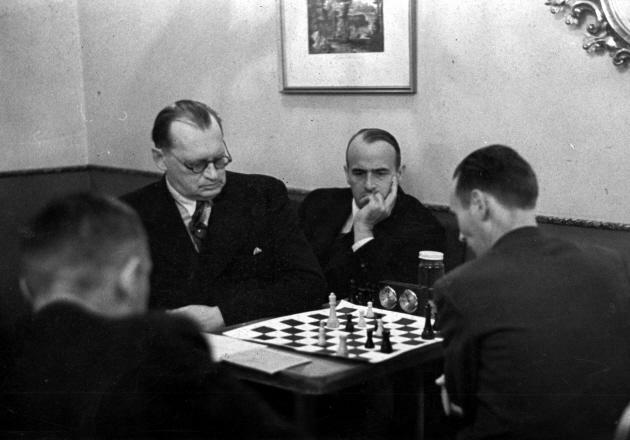 A fine individual shot of Alekhine, apparently taken around the same time, may be seen at the Gallica website. We are grateful to the Library for permission to show here some sample pages of the work, which, it seems, was not published. ‘Berlin’ should, of course, read Büsum. 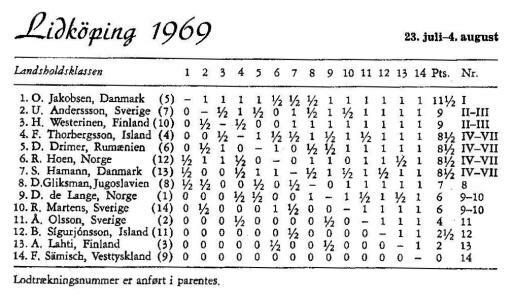 Bent Kølvig (Rødovre, Denmark) notes that according to Bent Larsen’s report on the Büsum tournament on page 156 of the July 1969 Skakbladet, Sämisch lost all 15 of his games on time (‘probably a kind of world record’, Larsen commented) and participated only because a Bulgarian grandmaster did not arrive. 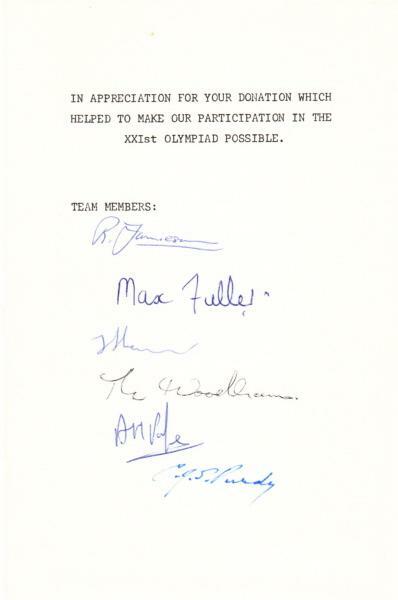 The accompanying report by Ole Jakobsen gave no details about Sämisch’s handling of the clock. 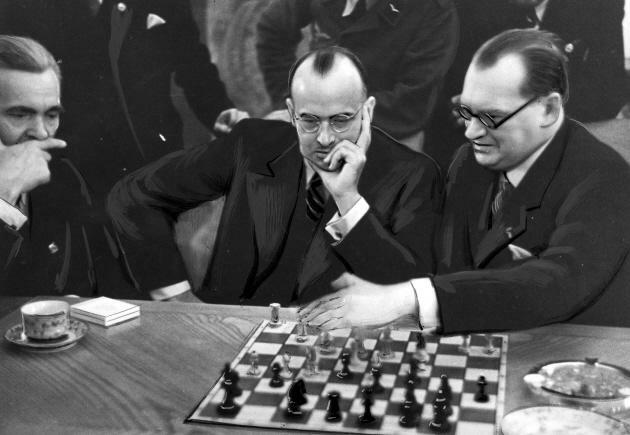 After referring to Sämisch’s performance in Büsum it states that in Lidköping he did not manage to make more than about half the requisite number of moves before, often in an equal or even superior position, he exceeded the time-limit. However, it is not specifically stated that he lost all his games on time. 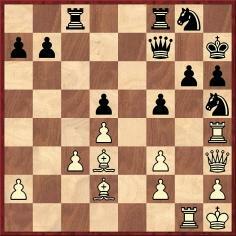 Did Capablanca play 40 h7 (rather than 40 Kf3)? 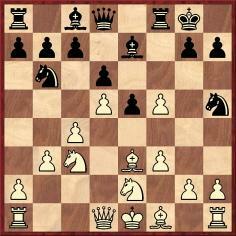 ... did he blunder away his queen with 49 cxb5 (allowing 49...Qg7+, although Black missed the opportunity)? To kill off, from the outset, any possible suspense, the answer to both questions is, of course, no. 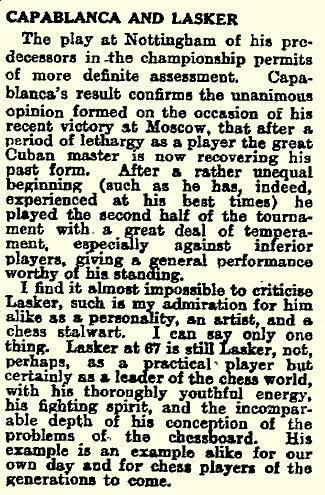 Indeed, the Cuban never played any game which reached remotely similar positions. 27 Kd3 b4 28 Bd4 Bd6 29 g3 Kf7 30 Bb6 Ke6 31 Kd4 Be5+ 32 Kc5 Bd6+ 33 Kc6 g5 34 Bc5 Bxc5 35 Kxc5 Ke5 36 Kxb4 Kd4 37 a4 Ke3 38 a5 d4 39 a6 d3 40 a7 d2 41 a8(Q) d1(Q) 42 Qe4+ Kf2 43 f4 Qd6+ 44 Kc4 Qa6+ 45 Kc5 Qa5+ 46 Kd6 Qb6+ 47 Ke7 Qxb3 48 Kxf6 gxf4 49 gxf4 Qc3+ 50 Qe5 Qc6+ 51 Qe6 Qc3+ 52 Kg5 Qg7+ 53 Kf5 Qf8+ 54 Qf6 Qc5+ 55 Kg4 h5+ 56 Kh4 Kf3 57 Qg5 Qf2+ 58 Qg3+ Qxg3+ 59 hxg3 Resigns. The ‘instructive’ nature of the episode lies elsewhere. 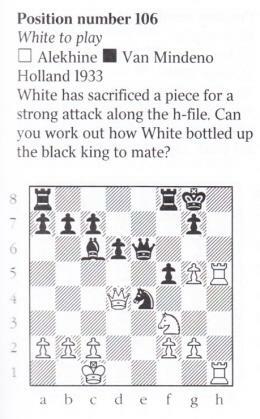 Misled by how the press had used the Forsyth notation, Fiala gave a mirror-image of the initial endgame position (obviously wrong, since 26...c6 cannot occur when the Sicilian Defence has been played). The reflected image meant that the score had to be ‘corrected’ throughout, and when 36...K-Q5 was interpreted as 36...K-K5 a further error turned that alleged move (...Ke4) into ...e4. Despite subsequent guesswork it was naturally impossible to make sense of the remainder of the score, and at move 51 it was not Dutt who gave up but Fiala. 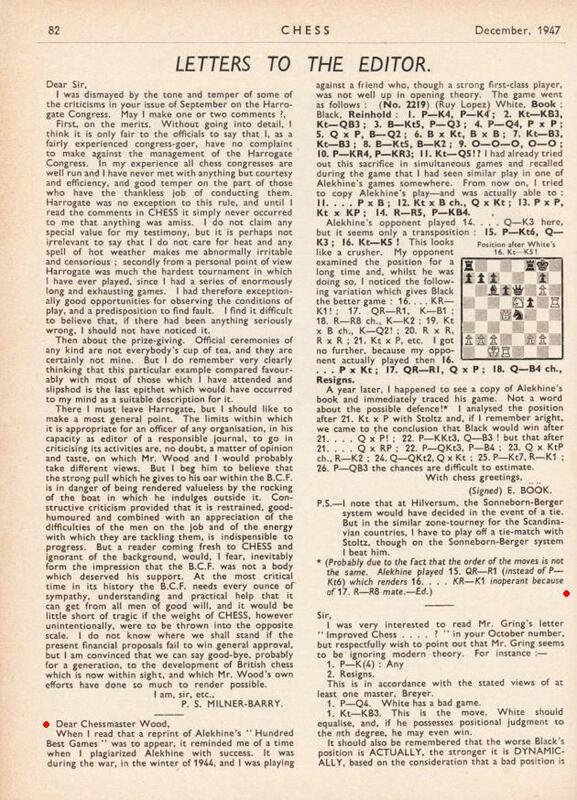 On page 313 of the July-August 1934 issue of Les Cahiers de l’Echiquier Français Tartakower wrote that Barnes’ Opening (1 f3) could gain recognition if two ‘arbitrary’ chess rules were abolished: the double pawn-move and castling. 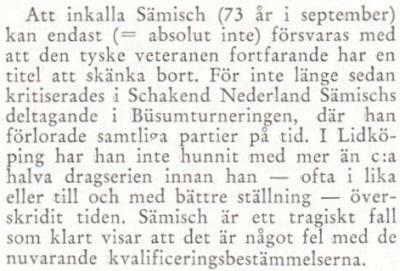 It is proving difficult to find particulars concerning Sämisch’s performance at Lidköping, 1969. 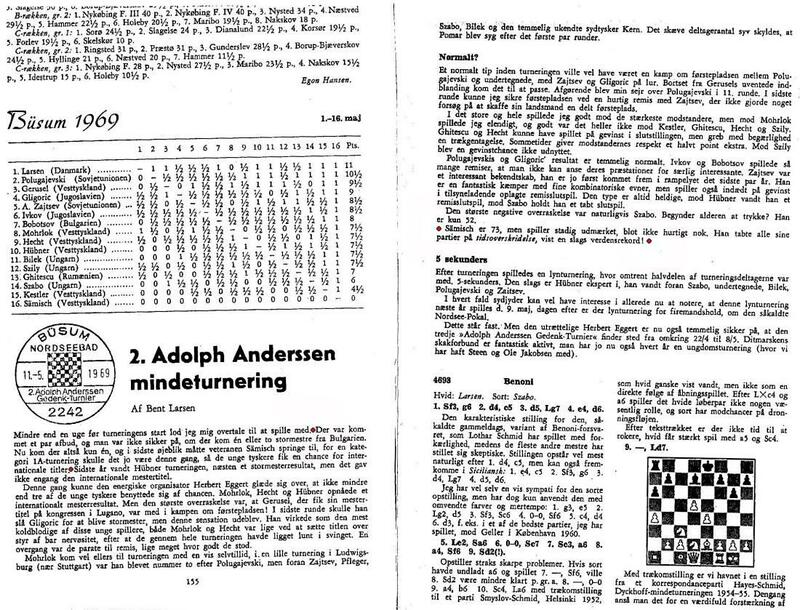 Calle Erlandsson (Lund, Sweden) notes a report on page 182 of the August 1969 Tidskrift för Schack that Sämisch overstepped the time-limit against Åke Olsson after only 12 moves. A game to be added to Fast Chess comes from Eduardo Bauzá Mercére (New York, NY, USA). 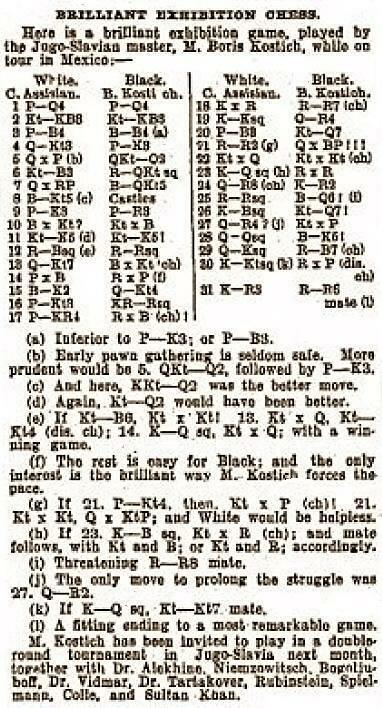 It was played in a rapid transit tournament (ten seconds per move) mentioned on page 182 of the April 1905 American Chess Bulletin. 56 a6 bxa6 57 bxa6 Bxg5 58 hxg5 Kxg5 59 a7 Resigns. 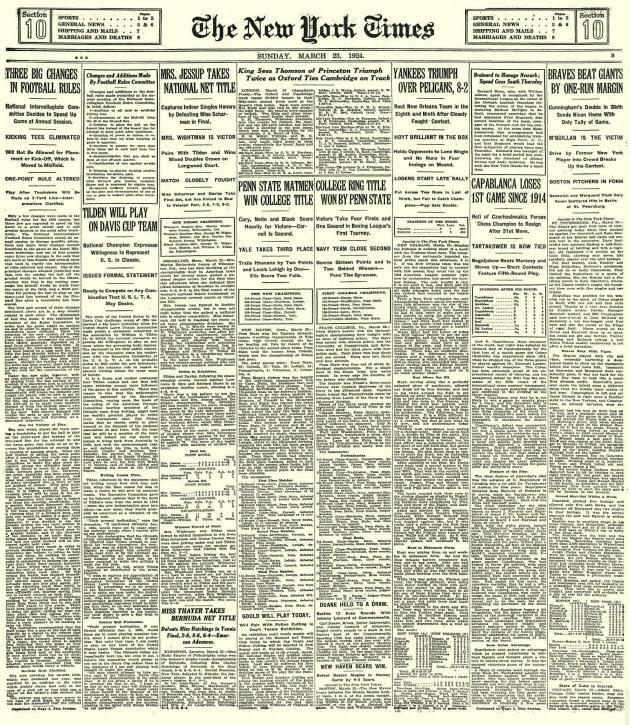 Source: Brooklyn Daily Eagle, 28 May 1905, page 9. 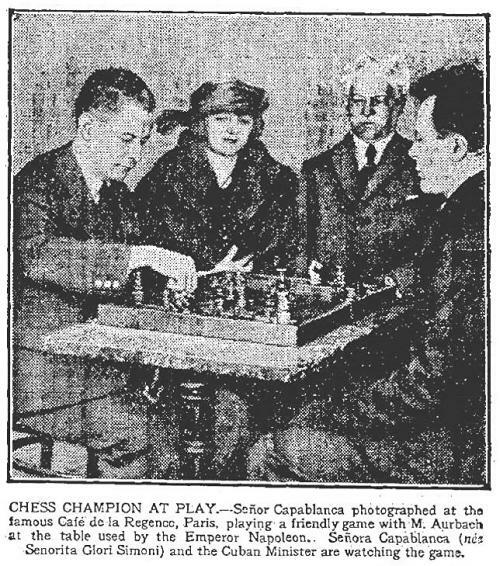 Later that year the photograph of Capablanca was published on page 126 of The Rice Gambit edited by H. Keidanz (an American Chess Bulletin Souvenir Supplement). Gene Gnandt (Houston, TX, USA) notes a webpage with detailed information on Clemens Palme Dutt (1893-1975).